Category: How Much Tax Are Singaporeans Really Paying? Due to the overwhelming response that we have received for the 10-part article on the tax comparison between Singapore and the Nordic countries, we have compiled 2 more articles to summarise what we have discussed so far and explain the significance of these articles. Singaporeans are paid the lowest wages and have the lowest purchasing power among the high-income countries, even though we have one of the world’s highest cost of living. Even though Singaporeans pay the same amount as the citizens in the Nordic countries do into taxes, social security/CPF and what we have to pay as out-of-pocket expenditure, this is unevenly distributed where the low-income and lower-middle income Singaporeans would not be able to afford and access basic necessities. Also, because of our low wages, we lose a much higher proportion of our wages into paying for these. For over the past one month, we have shown you how Singaporeans are paid low wages – the lowest wages among the high-income countries. This is even though Singapore has one of the highest prices and cost of living in the world. Also, we have shown that even though taxes are low in Singapore, when you look at how much we pay into taxes, social security/CPF and out-of-pocket expenditure for healthcare, education and retirement, we are actually paying almost the same amount as what the citizens in the Nordic countries pay into taxes and social security but receive healthcare, education and retirement for next to nothing. Not only that, because the poorest in Singapore have the lowest share of income in Singapore, as compared to the other high-income countries, this means because we are paying the same as the Nordic citizens, our purchasing power is a lot lower than the Nordic citizens. 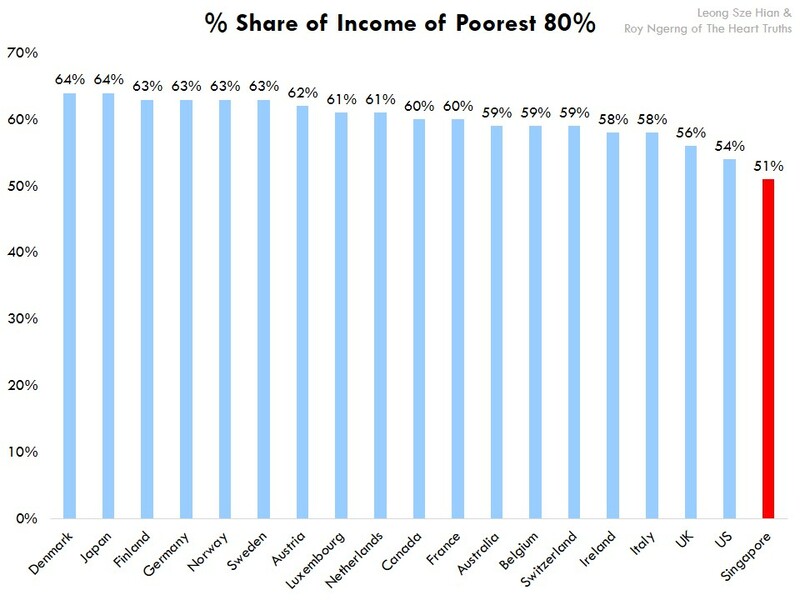 In fact, for the poorest 80% in Singapore, we are poorer than the 80% in the other high-income countries. So, in this finale article, let us put together the story for you – to let you see once and for all, what things are really like in Singapore. If you haven’t read the past articles, or you haven’t gotten the complete picture, this article is a must-read. It will give you the full picture once and for all. So, Singaporeans have been told that we pay low taxes, and because of that, the amount that the government can spend on social protection is thus also low. 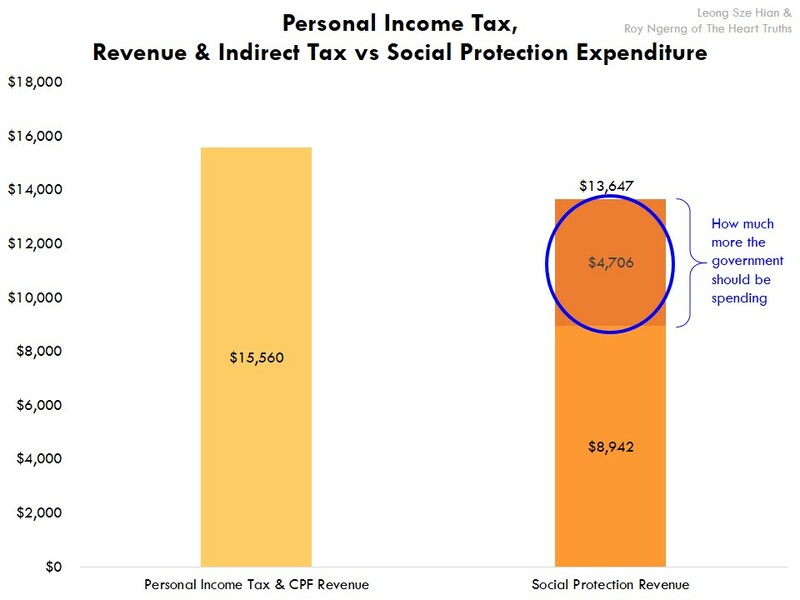 If you look at how much Singaporeans pay into personal income tax and social security/CPF, we pay $8,486 per capita and get back $8,942 in social protection (including withdrawals from the CPF) per capita (Chart 1). And if you compare this with what the citizens in the Nordic countries pay, they pay on average $20,087 per capita and get back $28,397 per capita in social protection (Chart 2). In comparison, the citizens in the Nordic countries get more bang for the buck – they get back on average 41% more in social protection, of what they pay into income tax and social security, while Singaporeans only get back only 5% more (Chart 3). But, as mentioned, for the citizens in the Nordic countries, they only need to pay personal income tax and social security, and get back healthcare, education and retirement for next to nothing. However, for Singaporeans, we have to pay an additional $7,774 per capita out of our pockets for these basic essentials (Chart 4). 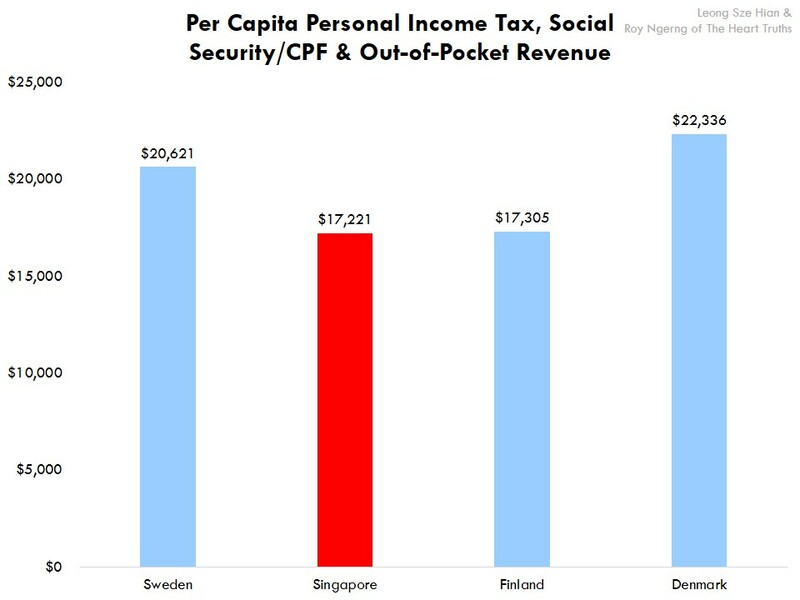 And so, when you compare what Singaporeans pay into personal income tax, social security/CPF and out-of-pocket expenditure for basic essentials – a total of $16,260 per capita – with what the citizens in the Nordic countries only need to pay into personal income tax and social security, you realise that Singaporeans actually pay almost the same amount as the citizens in the Nordic countries do (Chart 5)! Here’s what it is – if the Singapore government were to return back to Singaporeans for social protection at the same rate as the Nordic governments, this means that on the $16,260 that we pay, the Singapore government should pay an additional 41% into social protection – or a total of $22,986 per capita (Chart 6). The government already pays $8,942 in social protection and we pay $7,774 out-of-pocket. So, after deducting for these, this means that there is still an expenditure of $6,271 per capita which the government isn’t spending back for Singaporeans (Chart 7). To put things into perspective, this means that there is potentially $24 billion that the government isn’t spending on social protection! But so far, we have only looked at direct taxes. Let’s also look at indirect taxes. Then, you will get a better picture of how much the government should be spending but isn’t. This is because what we pay into indirect taxes is actually 3.5 times higher than what we pay into personal income tax. In comparison, the citizens in the Nordic countries pay about the same indirect tax as personal income tax (Chart 8). When we look at what Singaporeans pay into personal income tax, social security and indirect taxes, we would be paying $15,560 per capita. In the next chart, look at how much we pay and how much we get back in social protection. 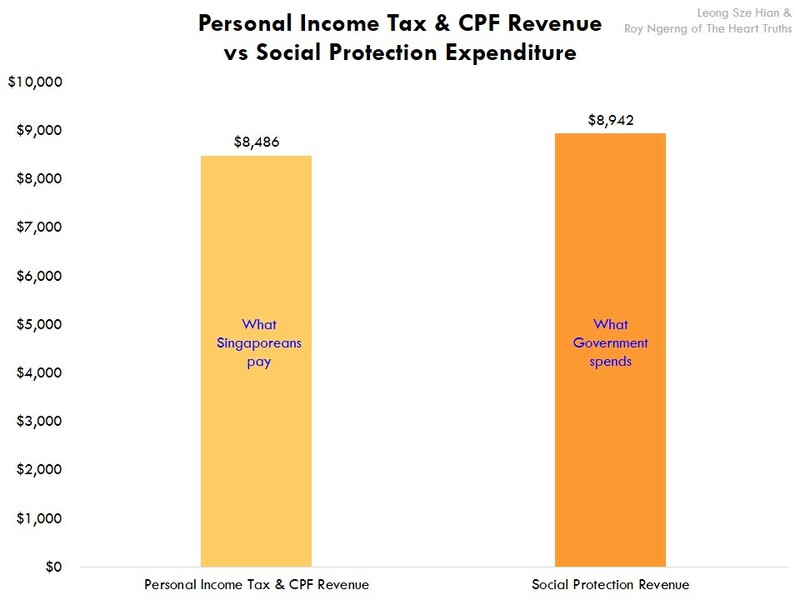 Of the direct and indirect tax, social security/CPF and out-of-pocket expenditure that Singaporeans pay, the government only pays 57.5% into social protection. However, for the Nordic countries, their governments would pay between 79% and 93% (Chart 10). If the government were to spend for social protection at the same rate as the Nordic governments, the government should be spending $13,647, or $4,706 more per capita (Chart 11). So, is it true that because Singapore’s personal income tax rate is lower and which is why the Singapore government cannot spend more on social protection? The Singapore government collects 3.5 times the amount of indirect taxes, as what we pay into personal income tax and social security/CPF. The Singapore government spends a much lower proportion of what is collected into social protection – 20 percentage points lower than the Nordic governments. 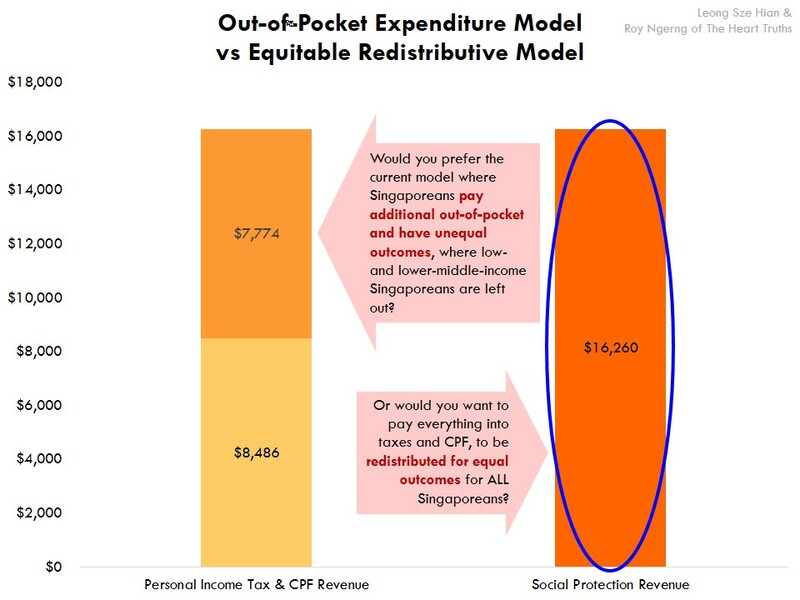 In total, what Singaporeans are paying into personal income tax, social security/CPF – and we also have to pay additional out-of-pocket expenditure for basic essentials – is $16,260. In comparison, the citizens in the Nordic countries only have to pay personal income tax and social security and get back the basic essentials for next to nothing. So, what’s the big deal then – if we are paying the same in whatever form but get back the same, then why should we bother? Well, it’s not the same. This is because the poor in Singapore receive the lowest wages, as compared to the poor in the Nordic countries. For someone who earns $800, say as a cleaner, the same person in the Nordic countries earn several times more (Chart 12). 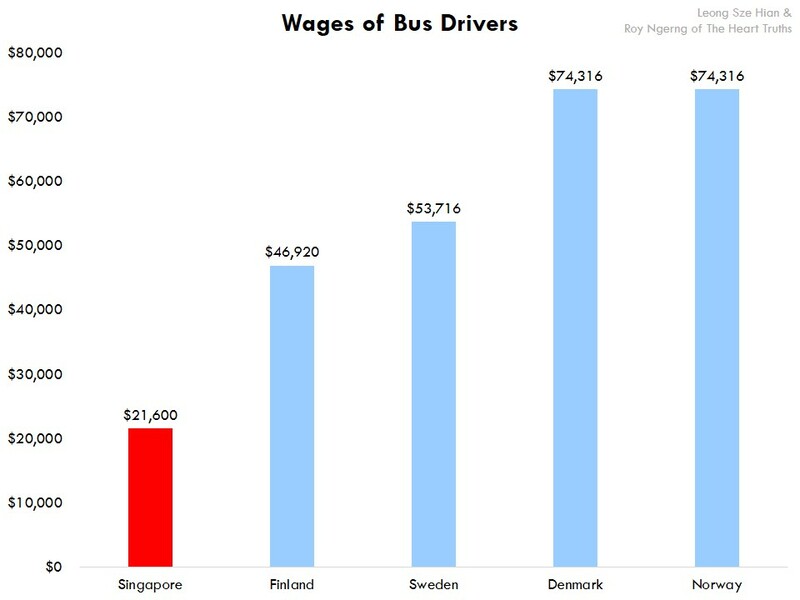 And for a Singaporean who earns $1,800, say as a bus driver, the same person in the Nordic countries would again earn significantly more (Chart 13) – this s 35% of the population in Singapore who earns $1,800 and below. Not only that, the poorest 20% in Singapore has only 5% of the share of income in Singapore. This is the lowest share, as compared to the high-income countries (Chart 14). In fact, for the poorest 80% in Singapore, we have only 51% of the share of income in Singapore – again, the lowest as compared to the high-income countries (Chart 15). Which means that the richest 20% in Singapore actually has 49% of the share of income in Singapore – the highest among the high-income countries (Chart 16). So, when you look at it, the poor in Singapore, and in fact, the median income earner, and the poorest 80% of the population are earning significantly lower wages than our counterparts in the Nordic countries. In fact, for the median wage earner in Singapore, they earn lower wages than the median wage earner in the Nordic countries (Chart 17). This is even though Singapore is the 6th costliest city in the world, whereas the Nordic countries are cheaper (Oslo, Norway is 18th, Copenhagen, Denmark is 21st; Stockholm, Sweden is 46th and Helsinki, Finland is 65th), yet Singaporeans earn the lowest wages. As such, Singaporeans might pay almost the same amount into direct and indirect tax, social security/CPF and out-of-pocket expenditure as the citizens in the Nordic countries, but when you look at it as a proportion of our wages, Singaporeans are actually paying out the highest proportion of our wages – 64.8%, as compared to between 34.6% and 59.4% in the Nordic countries (Chart 18). And because the poor earn even lower wages, we have calculated that for someone who earns $1,800 in Singapore, he/she wouldn’t be able to save after spending for food, transport, housing, healthcare and education. A person who earns $1,800 in Singapore wouldn’t be able to save and retire in Singapore – this is 35% of the population in Singapore. Meanwhile, the citizens in the Nordic countries would be able to save substantially (Chart 19). 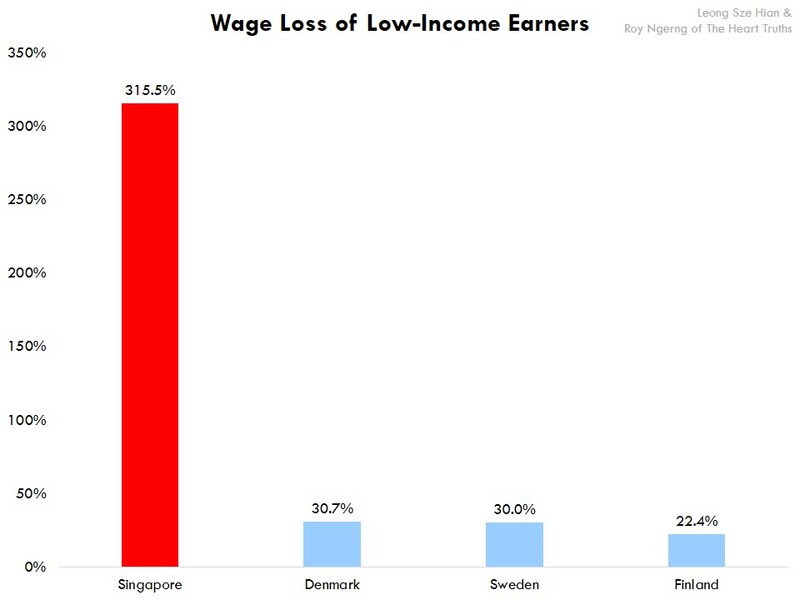 Finally, we calculate that for the low-income earners in Singapore, they are actually losing 315.5% of their wages – much higher than the citizens in the Nordic countries (Chart 20). And for the high-income earners, they would lose 47.1% of their wages – lower than the citizens in the Nordic countries (Chart 21). As such, you can see that even though Singaporeans are spending almost the same amount as the Nordic citizens per capita, is everything alright? It is not, because for the low-income and lower-middle income earners in Singapore, not only would they not be able to spend on even some of the basic essentials, they would not be able to access basic essentials such as healthcare, education and retirement, simply because they are paid too low wages to afford them. It is thus not a coincidence that many Singaporeans feel that they are not able to save, and retire. It is because we simply cannot. Given this situation, do you think that the current situation, where Singaporeans have to pay into taxes, social security/CPF and spend out of our pockets is a sustainable scenario? Or do you think that since Singaporeans are already paying the same amount as the citizens in the Nordic countries anyway, that it might be a more efficient model if we were to pay what we currently pay out-of-pocket into taxes, so that this can be more equitably distributed, and allow all Singaporeans to have the peace of mind to be able to access healthcare and education, and retire (Chart 22)? But this is still not the full story – because Singaporeans are paid low wages, we should rightfully be paid about twice as much as we are currently paid now. This would mean that instead of paying 64.8% of our wages into taxes, social security/CPF and out-of-pocket expenditure, we would only be paying 32.4% of our wages – even lower than what the Nordic citizens have to pay (Chart 23)! Now, do you see the full story? In summary, Singaporeans are paid the lowest wages and have the lowest purchasing power among the high-income countries, even though we have one of the world’s highest cost of living. What’s more, for the low-income in Singapore and 80% of the population, they have a much lower share of the income than the other high-income countries. 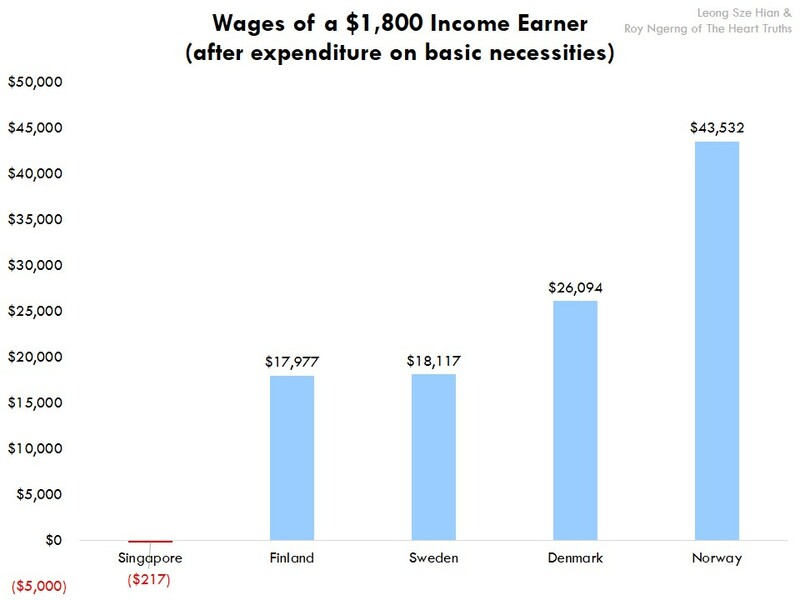 And even though we pay the same amount as the citizens in the Nordic countries do into taxes, social security/CPF and what we have to pay as out-of-pocket expenditure, this is unevenly distributed where the low-income and lower-middle income Singaporeans would not be able to afford and access basic necessities. Also, because of our low wages, we lose a much higher proportion of our wages into paying for these. Singapore faces a chronic situation where wages have been depressed for far too long and prices have shifted upwards so quickly that many Singaporeans are being left out in the cold. It might be said that Singapore has a low personal income tax but when everything is added together, what Singaporeans pay is actually very high, and on par with what the citizens in the Nordic countries pay. Yet, the Singapore government does not return in social protection on par with what the Nordic governments do, even as Singapore runs a massive surplus of $36.1 billion (according to IMF guidelines), which as we have calculated, would be more than enough to cover for the current out-of-pocket expenditure without even needing to increase taxes. So, why is this not being done? Why is the cash-flow in Singapore so lopsided and messy that low- and lower-middle income Singaporeans, and in fact, the median wage earner are made to suffer chronic low wage situations and lose a significant percentage of their wages? 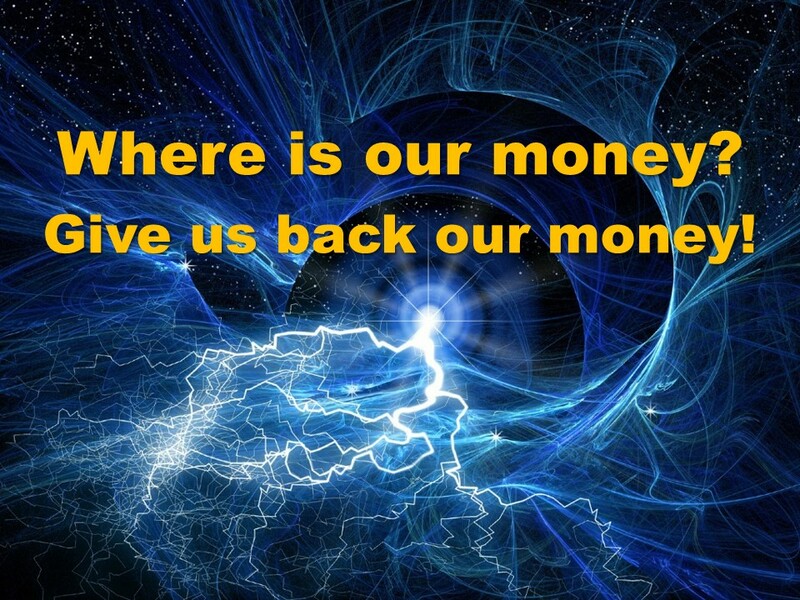 Where has our money gone? You can read the other parts of the article here. Written by Roy Ngerng 5 Comments Posted in How Much Tax Are Singaporeans Really Paying? Due to the overwhelming response that we had received for the 10-part article on the tax comparison between Singapore and the Nordic countries, we have compiled 2 more articles to summarise what we have discussed so far and explain the significance of these articles. Singaporeans might pay the lowest personal income tax, but when looking at comparable expenditure as to what the citizens in the Nordic countries do, we actually pay the same amount as they do, and lose a much larger proportion of our wages than they do. 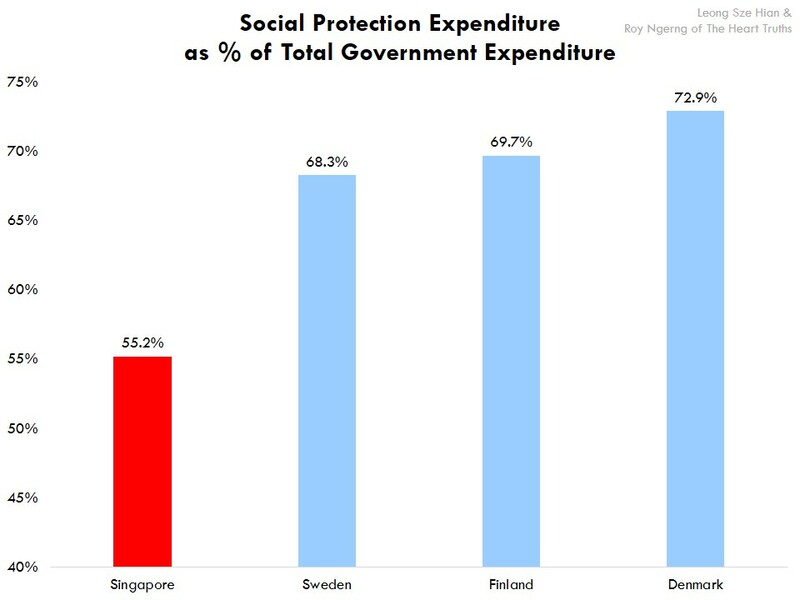 The Singapore government spends the lowest on social protection, as compared to the Nordic countries. In this article, you will be able to see a snapshot of how much tax Singaporeans are really paying. Click on the links if you would like to read more. Low-income Singaporeans have a lower purchasing power than high-income Singaporeans, as they would need to pay 36% of their wages into tax (zero tax) and CPF, whereas for a high-income earner who earns say $20,000 a month, his total tax (10.4% – $20,750 tax payable before reliefs) and CPF (15.3% – maximum $30,600 contribution on income of $85,000) rate is a much lower 25.7% (Chart 1). We have been told that Singaporeans pay one of the lowest taxes in the world, and when we look only at personal income tax as a proportion of the total government revenue collected, indeed, it does look like Singaporeans pay low taxes – personal income tax forms only 9.6% of the total government revenue, whereas it forms between 34.3% and 54.7% in the Nordic countries (Chart 2). However, when you look at how much Singaporeans pay into personal income tax, as well as CPF, you will see that what Singaporeans are paying isn’t actually that low. 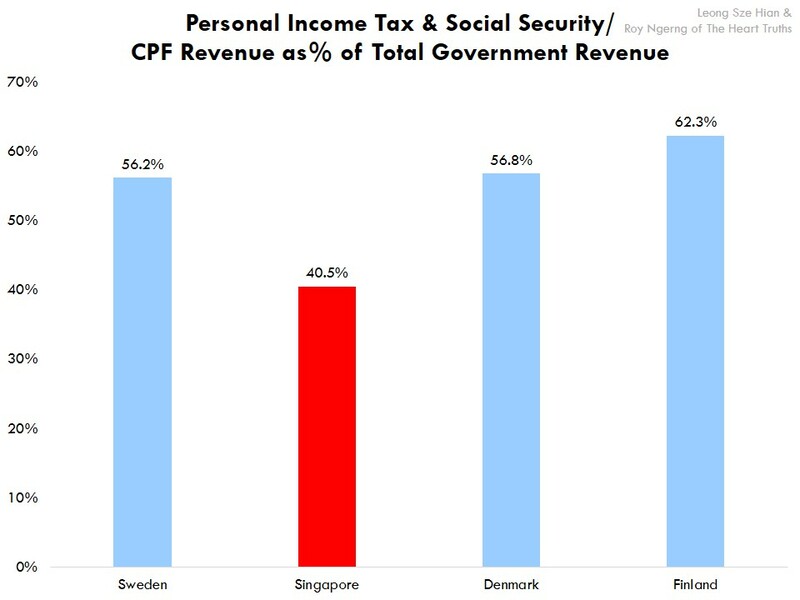 Personal income tax and CPF would form 40.5% of the total revenue collected in Singapore, while in the Nordic countries, it isn’t that far off – personal income tax and social security form between 56.2% and 62.3% of total revenue (Chart 3). 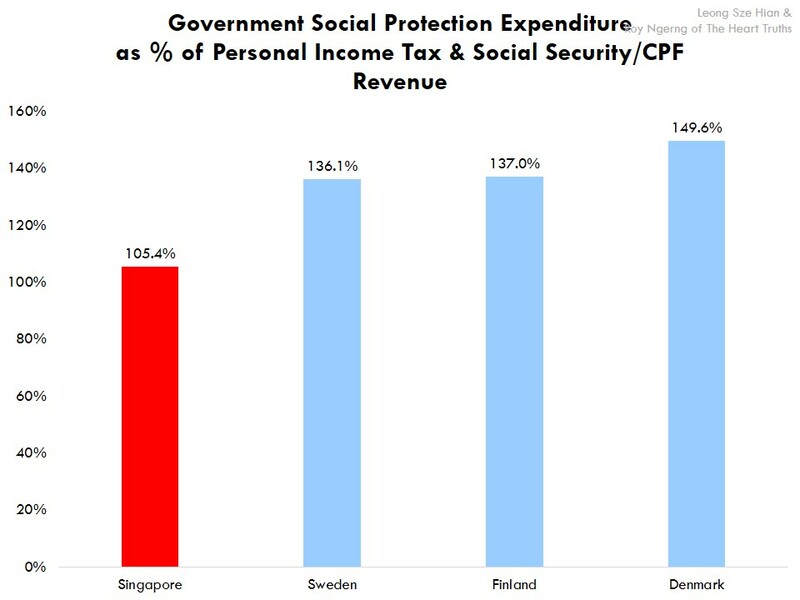 In fact, do you know that even though personal income tax is low in Singapore, the CPF contributions collected by the government is 323% times the personal income tax collected, whereas the social security revenue collected in the Nordic countries is only between 4% and 82% of the personal income tax collected (Chart 4) – so overall, what we are really paying is 3 times more than the personal income tax. Next, in the Nordic countries, the citizens can obtain next to free healthcare and free education, as well as much higher retirement funds. However, in Singapore, Singaporeans still have to use our own money to pay for healthcare, education and retirement. We have to pay an additional $4 billion for healthcare, $6 billion on education and $19.7 billion for retirement, or a total of $29.7 billion. And if you look at how much this $29.7 billion is, as a proportion of what we pay into personal income tax and CPF, Singaporeans actually pay a whooping 91.6% more (Chart 5). Note that in the Nordic countries, all they have to pay is into personal income tax and social security, and would receive almost everything for free. If we add the out-of-pocket expenditure of $29.7 billion into what we pay into personal income tax and CPF, Singaporeans would be paying $62.1 billion. In comparison, the citizens in the Nordic countries pay between $89.7 billion and $168.2 billion. If you look at how much each citizen would pay, a Singaporean would pay $16,260 on average, whereas the citizens in the Nordic countries would pay between $17,305 and $22,336 (Chart 6) – Singaporeans actually pay the same personal income tax and social security rate as the citizens in the Nordic countries! We don’t have the lowest taxes! Next, if we look at how much each government spends on social protection, the Singapore government spends $22.4 billion on social development, and $11.7 billion is withdrawn from CPF by Singaporeans – a total of $34.1 billion in social protection. In comparison, the Nordic governments spend between $122.8 billion and $228.9 billion. On a per capita basis, you would see that the Nordic governments would spend between $23,699 and $33,421 on social protection, but the Singapore government spends a much lower $8,492 (Chart 7). But what is more important is that when you compare what the governments spend for social protection, with what the citizens pay in personal income tax and social security, the Singapore government only spends 105.4% of the personal income tax and social security, whereas the Nordic governments would spend between 136.1% and 149.6% (Chart 8) – or in other words, the Nordic governments spend 36 percentage points more than the Singapore government is willing to. But, as discussed, Singaporeans spend an additional $29.7 billion out-of-pocket, or $7,774 more per person. Thus if you add this up with what we pay in personal income tax and CPF, Singaporeans are actually paying $16,260. And compared to what the government spends in social protection, the $8,942 is only 55% of what we pay (Chart 9) – in other words, the Nordic governments would spend almost three times as much as what the Singapore government is willing to pay. Not only that, the Nordic government would spend more than what they collect from its citizens to subsidise for its citizens, but in Singapore, the citizens have to pay more to subsidise for the government instead! Next, when we compare direct and indirect taxes, we get another revelation. Singaporeans pay an additional $27 billion in indirect taxes. When we combine the direct and indirect taxes, Singaporeans would pay $23,334 on a per capita basis. This is in comparison to the $26,125 and $35,826 that the citizens in the Nordic countries would pay (Chart 10). 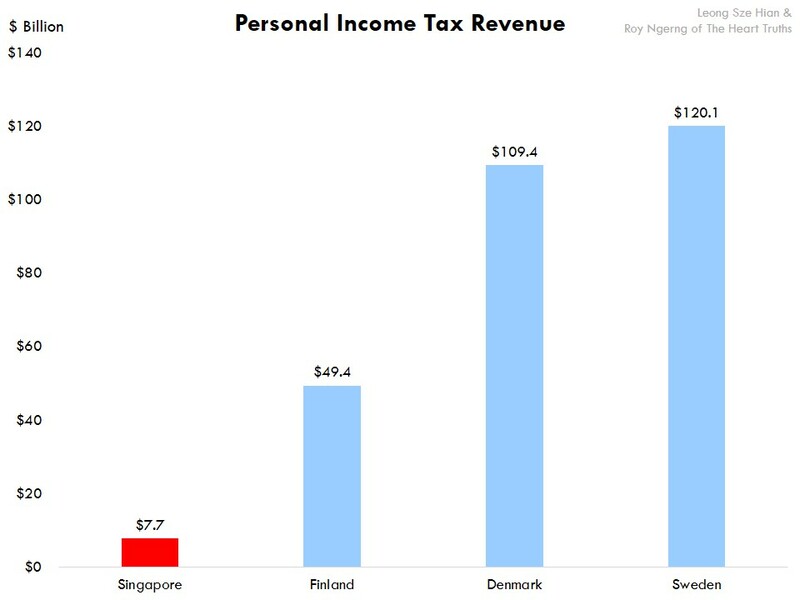 So, you can see that even though Singaporeans supposedly pay the lowest personal income tax, when you add the indirect taxes, Singaporeans actually pay as much tax as the citizens in the Nordic countries do! But can the Singapore government increase its expenditure to provide free healthcare and education for Singaporeans, and increase our retirement funds? According to the International Monetary Fund Special Data Dissemination Standard, Singapore has $36.1 billion in surplus. 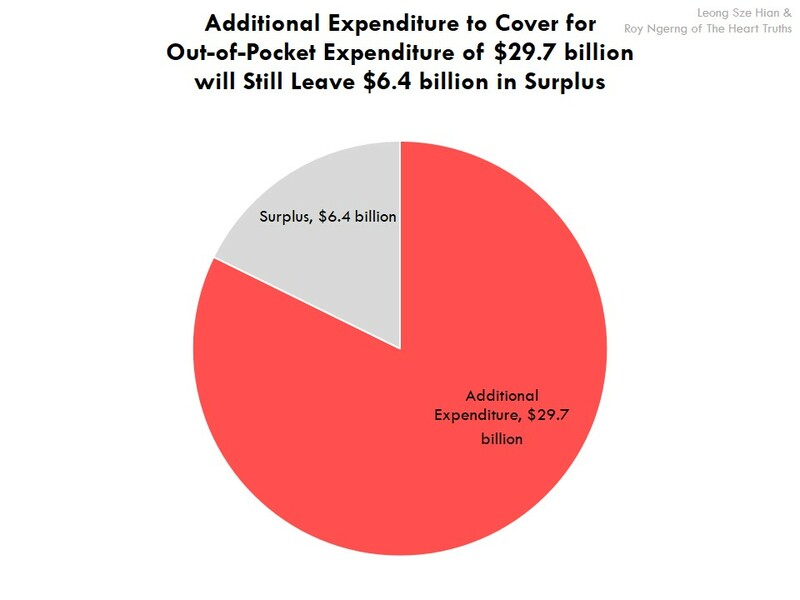 If the government would spend another $29.7 billion to cover for what we pay as out-of-pocket expenditure for healthcare, education and retirement now, there would still be $6.4 billion left in surplus. Finally, if you really calculate, the low-income are not paying only 36% into their personal income tax and CPF – their actual wage loss is 315.5% of their wages. This is compared to between what the 0% personal income tax and social security that the low-income Danes pay and the 30% that low-income Swedes pay (Chart 11). 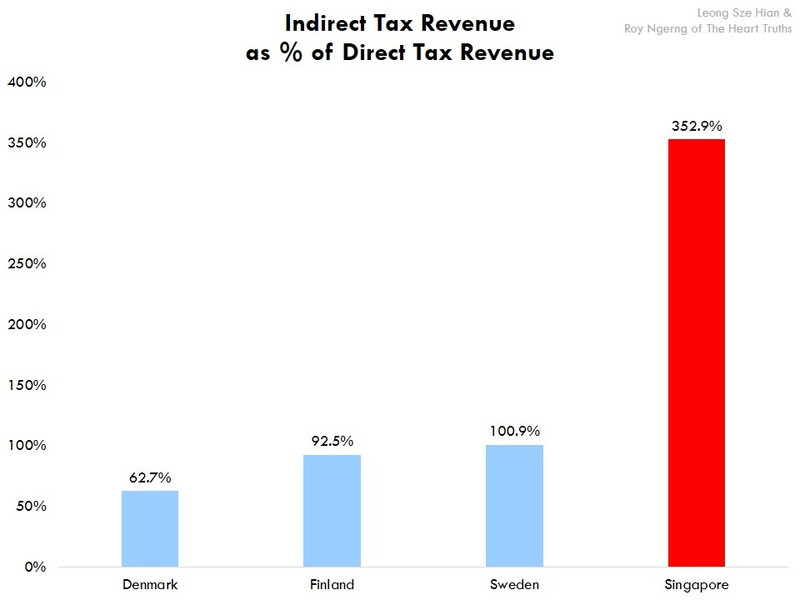 The 315.5% that Singaporeans lose is significantly higher than what the citizens in the Nordic countries pay. For the high-income Singaporeans, instead of the 20% personal income tax and social security that they would pay, they would actually lose 47.1% of their wages. And when compared to the high-income earners in the Nordic countries, they would pay between 51.7% and 60.6% in personal income tax and social security –much higher than what the high-income earners in Singapore would pay (Chart 12). As we had also shown, for a cleaner in Singapore, as compared to his/her counterparts in the Nordic countries, he/she would go into a debt of $$1,370 in a year, after deducting for personal income tax and social security, and spending for food, transport, housing, healthcare and education. 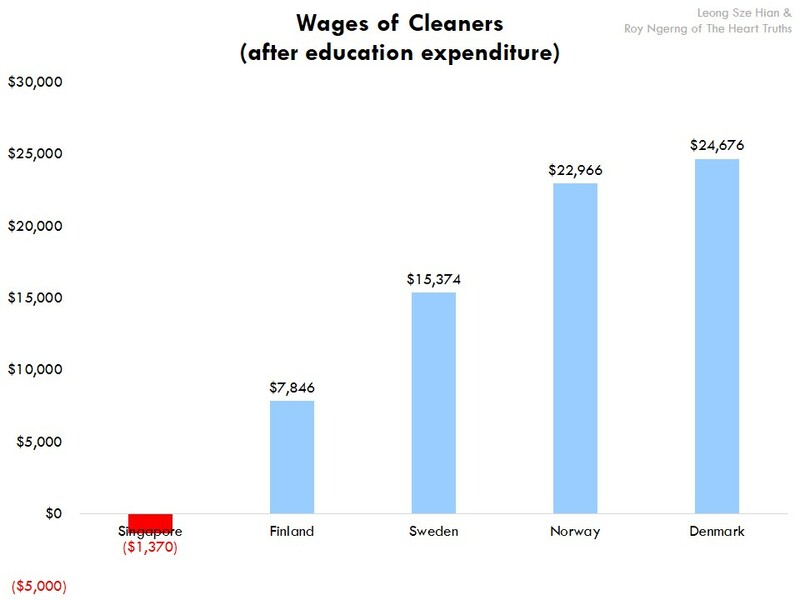 However, in the Nordic countries, cleaners would still be able to save, at between $7,846 and $24,676 – because healthcare and education is free (Chart 13). In the end, the question that we have to ask is this – if Singaporeans are actually paying the same tax and social security as the citizens in the Nordic countries, should we also be receiving free healthcare and education as they do? More importantly, because the low-income earners in Singapore have to pay more than what they earn and have to go into debt, should Singapore restructure our cash-flow structure to ensure that the poor in Singapore are still able to save? Clearly, it is no longer an excuse to claim that because Singaporeans pay the lowest taxes, that the government cannot increase subsidies. First, it has been shown that Singaporeans pay as much in tax and social security as the citizens in the Nordic countries. Second, the Singapore government has a much higher surplus of $36.1 billion, than has been declared. As such, there is more than enough for the money to be reshuffled to provide for free healthcare and education, and ensure that all Singaporeans are protected, and not only a select few. The income inequality and poverty rate in Singapore – the highest among the high-income countries needs to be immediately resolved, and has been shown, can be easily done. Right now, what we lack is political will and commitment to the protection of Singaporeans. 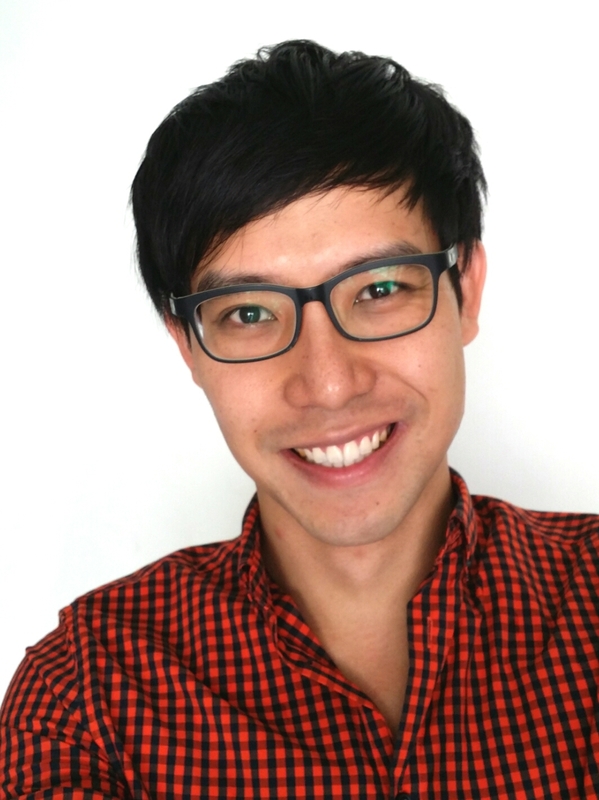 Written by Roy Ngerng Leave a comment Posted in How Much Tax Are Singaporeans Really Paying? This is a 10-part series which will analyse the tax that Singaporeans are paying, in comparison with the Nordic countries. It has been said that Singaporeans pay one of the lowest taxes in the world, and that the Nordic countries pay one of the highest taxes in the world. This series would explore this matter in greater depth, and seek to have a better understanding of what the truth really is. 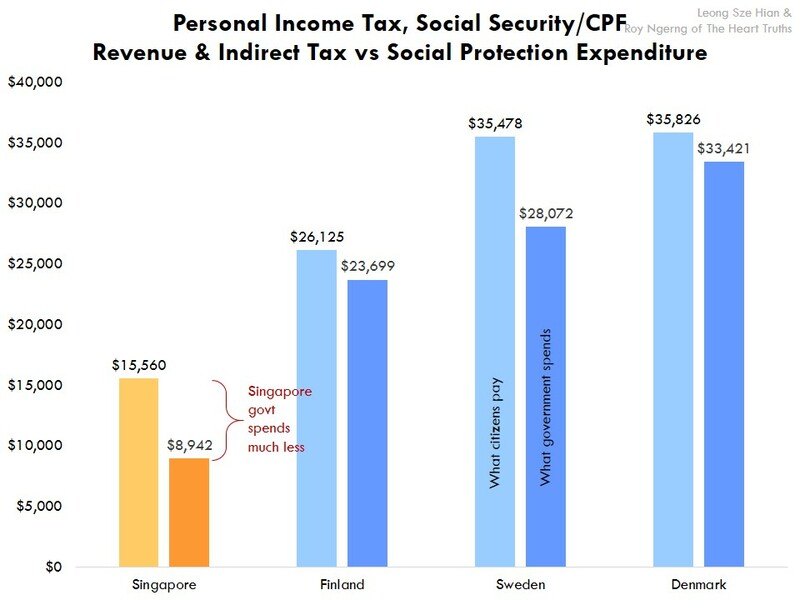 Even though personal income tax is the lowest in Singapore, low-income Singaporeans lose a much larger proportion of wages into tax, social security and spending into basic necessities, than the citizens in the Nordic countries. 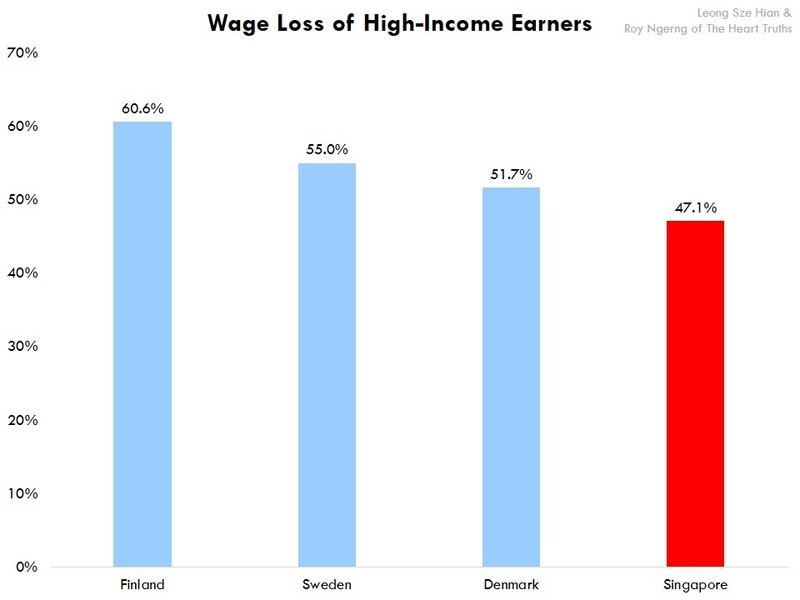 High-income Singaporeans lose the smallest proportion of their wages, than citizens in the Nordic countries. We have finally come to the question that we’ve started off asking with, for this series of articles. Let’s take a look at the situation for low-income earners first. As mentioned in part 3 of this article, “According to the Inland Revenue Authority of Singapore, for the lowest-income earners in Singapore, the tax rate is 0%. For the highest-income earner, they would need to pay an overall tax of 20%. As such, for the low-income earners, they would have to part with 36% of their wages. As we had also written previously, “to the extent the Government earns a higher rate of return on the CPF funds than what it pays to members; there is an implicit tax on CPF wealth”. This means that for Singaporeans, the lowest interest rates that we obtain on our CPF is 2.5%. However, Temasek Holdings, which our CPF has over the years been directly or indirectly been invested in, earns an annualised return of 16% for the last 39 years, since its inception. GIC earns about 6% in US$ terms over the last 20 years or so. Assuming 1% of the interest (assuming a combined average return of say 7%) goes to the administrative costs of managing our CPF, the 3.5% that isn’t returned to Singaporeans may arguably, be considered “implicit tax”. So, this would mean another 3.5% tax that Singaporeans have to part with. Also, when compared to the other countries, Singapore’s wage share of total GDP is only 42.5%, as compared to the average of about 57.5% among the other high-income countries. As such, there about 15% in the wage share that isn’t being returned to Singaporeans. The median wage of Singaporeans is $3,480, including employer CPF. If Singaporeans are only earning a wage share of 42.5%, and should be earning 57.5%, this would mean that we should be earning $4,708. The lost wages of $1,228 that we are not earning, or 35.3% of our current median wage, represents a 35.3% of our wages lost. Finally, for the $29.7 billion out-of-pocket expenditure that Singaporeans have to pay by ourselves for healthcare, education and retirement, which the citizens in the other countries pay into personal income tax, from a cash-flow perspective, this would be considered “tax” in the Nordic countries. The $29.7 billion is 91.6% of the total personal income tax and CPF amount. 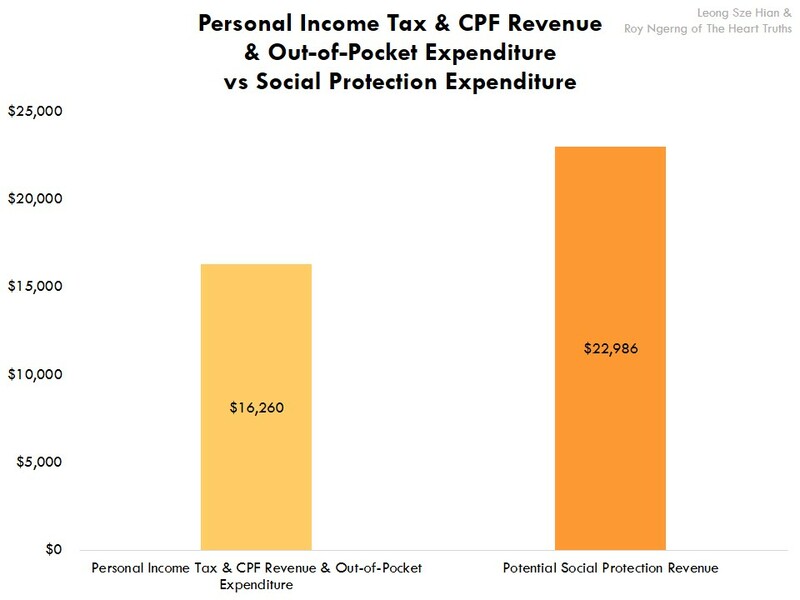 As a proportion of the 36% of CPF that low-income Singaporeans pay, the out-of-pocket expenditure would look like an additional 33% “tax”. In total, when we look at it overall, in terms of cash-flow, low-income Singaporeans are potentially losing 215.5% of their wages. 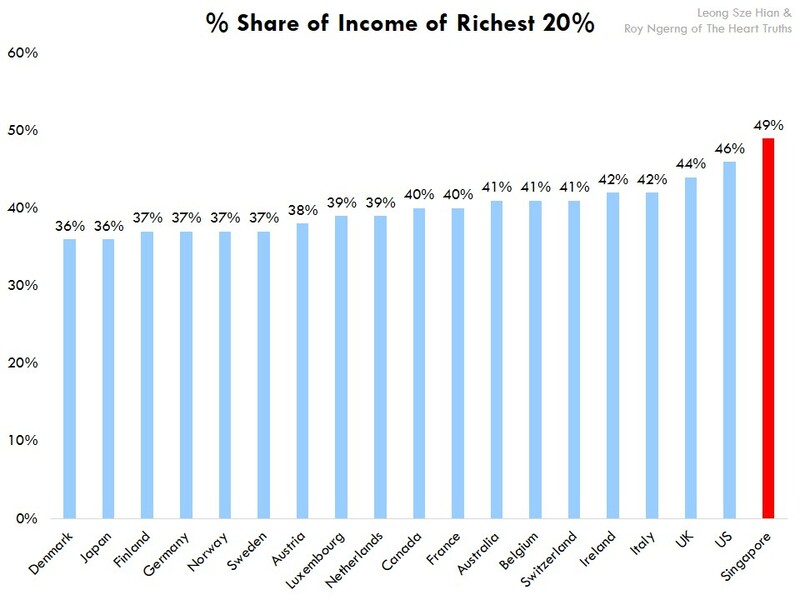 As also discussed in part 2, as compared to the other high-income countries, the poorest 20% in Singapore have only 5% of the total income share. This is about half of what the other high-income countries have. Thus this would mean an additional loss of 100% of their wages – are low-income Singaporeans losing 315.5% of their wages then? As we had illustrated in part 1 of the article, indeed, low-wage Singaporeans would fall into debt because of their depressed wages and low purchasing power. In most likelihood, they would fall into debt and would never be able to retire. Indeed, it is a no wonder, since they are losing 315.8% of their wages. Low-wage Singaporeans are potentially losing 315.5% of their wages. As we had illustrated in part 1 of the article, indeed, low-wage Singaporeans would fall into debt because of their depressed wages and low purchasing power. In most likelihood, they would fall into debt and would never be able to retire. Indeed, it is a no wonder, since they are losing 315.5% of their wages. What about for high-income Singaporeans? They would pay relatively less in percentage terms into CPF, and 20% personal income tax, which also means that they may not be as much affected, on a relative basis, by the implicit tax of 3.5%. Generally, they would be affected by the lost wage share of 35.3%. They would similarly be affected by the $29.7 billion “additional tax” of the out-of-pocket expenditure, which on their 20% personal income tax, would be an additional 18.3% “tax”. This would result in a wage loss of 58.9%. However, the richest 20% in Singapore has a 49% share of income – the highest among the high-income countries and about one-fifth (20%) higher than the average of other high-income countries. Thus after accounting for this, this would mean that their wage loss of 58.9% would be reduced to about 47.1%. Thus, if we look at it as a whole, for low-income Singaporeans, are they losing 315.5% of their wages? Does that explain why they are in a chronic debt situation? For high-income Singaporeans, instead of the 20% tax that they are paying, are they actually losing more of their wages, at 47.1%? When you compare it with the Nordic countries, of the low-income workers, the Danes would pay 0% in personal income tax and social security, the Finns 22.4% and the Swedes 30%. This is in comparison to the wage loss of 315.5% among low-income Singaporeans (Chart 1). For the high-income earners, the Danes would pay 51.7% in personal income tax and social security, the Finns, 60.6% and the Swedes 55%. 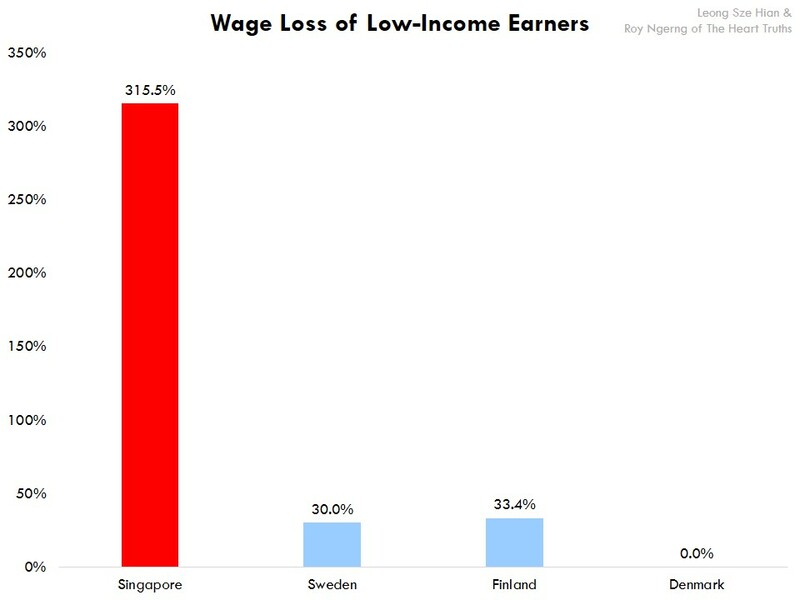 Comparatively, high-income Singaporeans would lose a lower 47.1% of their wages (Chart 2). As we had discussed in the previous parts of this article, Singaporeans actually pay a similar amount into tax, CPF and out-of-pocket expenditure for healthcare, education and retirement as the citizens in the Nordic countries do. However, the outcomes are very uneven in Singapore. The poor in Singapore would not be able to access healthcare and education, and would not be able to retire. On the other hand, for the poor in the Nordic countries, they would be able to access healthcare and education, and they would also be able to save and retire. At the end of this series of articles, we would like to ask Singaporeans – if Singaporeans are actually paying as much as the citizens in the Nordic countries, and where we are in a situation where the poor are left out of the system, do we want to shift our cashflow structure to be somewhat similar to the Nordic countries, so that all Singaporeans would be protected, and would continue to be able to contribute to Singapore together? Written by Roy Ngerng 4 Comments Posted in How Much Tax Are Singaporeans Really Paying? 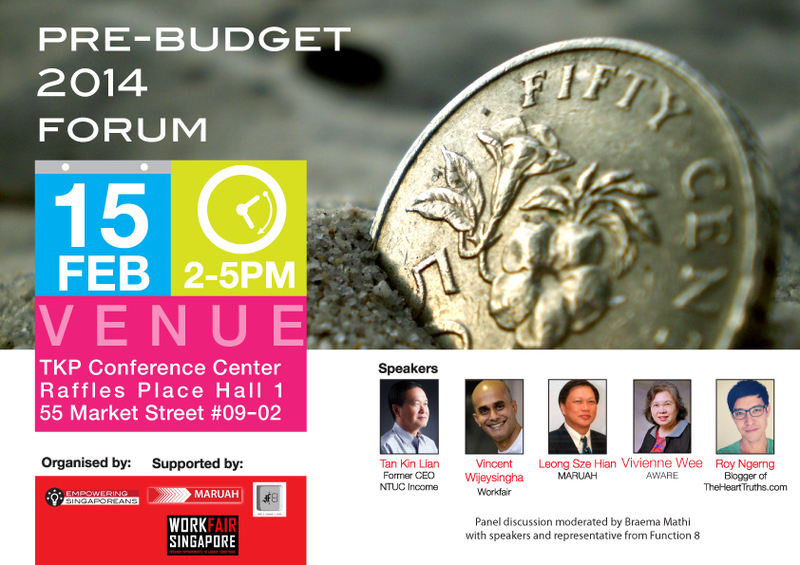 Tax Part 9: How Much Is The Lost Expenditure In Singapore Because The Poor Cannot Afford Basic Necessities? Because the poor are unable to afford healthcare and education, there is lost expenditure in Singapore that is not spent. 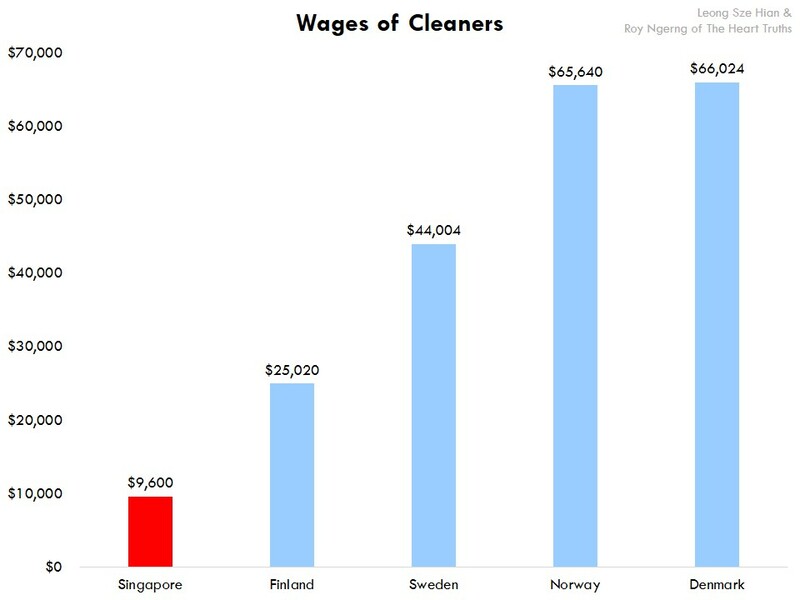 Singaporeans pay the same as the citizens in the Nordic countries do. 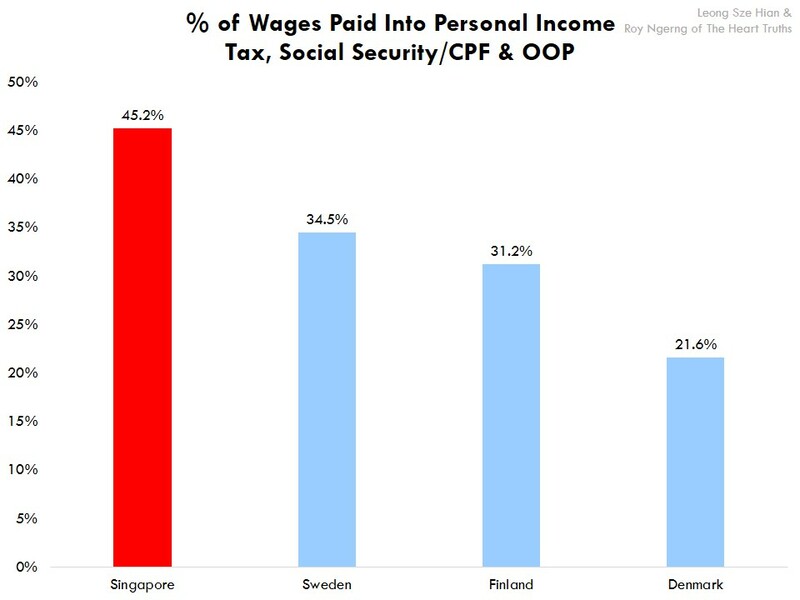 Singaporeans also pay the highest proportion of our wages than the Nordic countries into what they would pay similarly into tax and social security/CPF. By now, you would have realised that when it comes to the taxes, social security and out-of-pocket expenditure that Singaporeans spend on basic necessities, we actually spend about the same amount as what the citizens would pay into taxes and social security, to get not only what we have, but more in return – next to free healthcare, free education and higher retirement funds. But do you know that of the current out-of-pocket expenditure that we are spending in Singapore, we are not even yet spending at the optimum level? This is because there is a proportion of the poor who are not able to afford healthcare, and only 30% of Singaporeans are enrolled into university. Thus there is some lost potential expenditure there, due to the under-consumption of Singaporeans, because a lack of affordability and availability. And how much is this really? If so, of the current out-of-pocket expenditure, instead of only spending $4.0 billion on healthcare, Singaporeans should rightfully be spending $6.6 billion. The $2.7 billion underspending would be due to the fact that poorer Singaporeans are not able to afford healthcare, and have thus chosen not to spend. And when we look at education, only 30% of each cohort of Singaporeans are able to enter universities. As compared to the other high-income countries, this would be at about 70%. As such, about 40% more Singaporeans should be entering universities but are not doing so, because there is a lack of universities in Singapore being built. If this is the case, then of the current expenditure that is being spent on university education, there is another $1 billion that is not being spent, because Singaporeans are not able to enter universities. If so, what we really should be paying into personal income tax, CPF and out-of-pocket expenditure should be $17,221 per capita, instead of the current $16,260 now. This would put up firmly with what the citizens in the Nordic countries are actually paying, of between $17,305 and $22,336 (Chart 1). 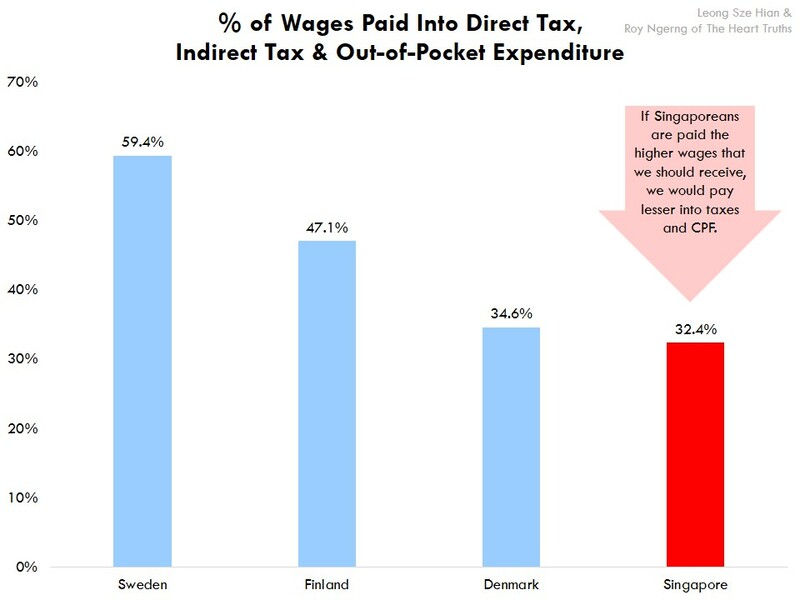 This would also mean that as a proportion of our income, Singaporeans are actually paying more than half, or 57.8% of our wages into personal income tax, CPF and out-of-pocket expenditure (Chart 2) – we would be spending 19 percentage points more of our wages than the Nordic countries! And when we look at what we pay into direct tax, indirect tax and out-of-pocket expenditure, we would be spending $24,295, as compared to the current $23,334 (Chart 3). What this means is that we are paying 67.5% of our wages (Chart 4) – we would be spending 20 percentage points more of our wages than the Nordic countries! What these all means is that Singaporeans have a much lower purchasing power than the citizens in the Nordic countries. But that’s not all. 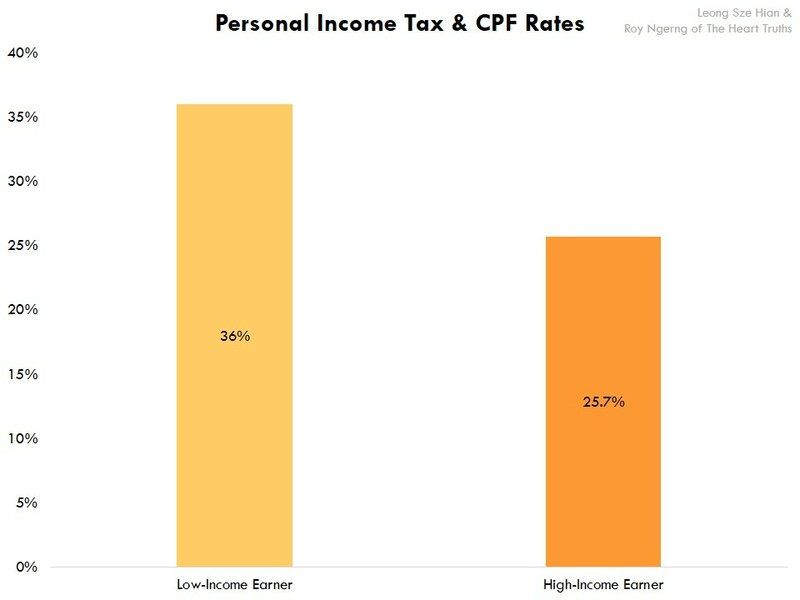 As we had also shared in part 1 and 2, the lower-income Singaporeans actually pay a higher personal income tax and CPF contribution than the high-income Singaporeans – low-income Singaporeans pay 20.8% in personal income tax and CPF whereas the high-income pay 16.65%. Also, for more than half of the poorer and middle-income Singaporeans, most of us wouldn’t be able to save but we will go into debt and never be able to retire. Yet, for the highest-income earners in Singapore, they will however be able to save, and also get to save more than citizens in the Nordic countries. Thus when we talk about how Singapore’s purchasing power is low, as compared to the Nordic countries, we are really referring to the low- and middle-income Singaporeans. What is happening is that there is such a severe lack of purchasing power among the low- and middle-income Singaporeans that the burden of the inability to pay is being carried by them. 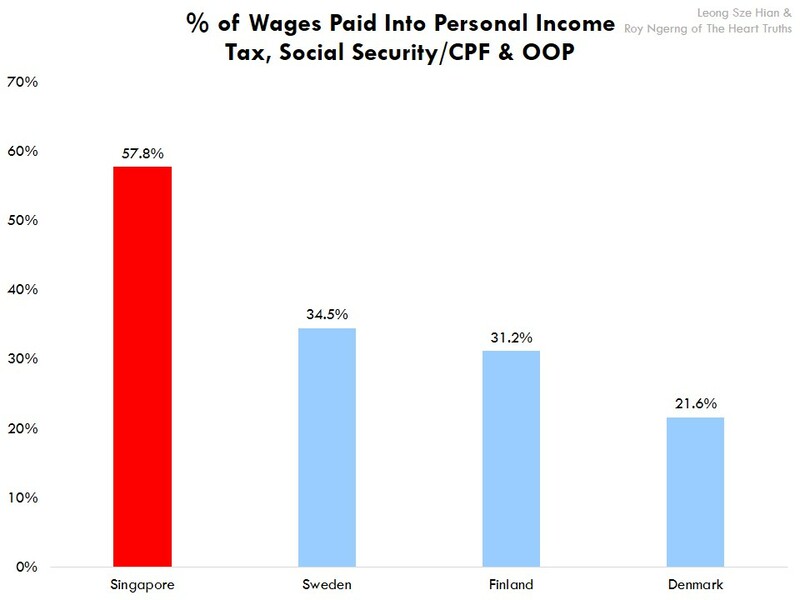 So, by now, you can see that not only do Singaporeans actually pay the same taxes and social security as the citizens in the Nordic countries, when we look at it as a proportion of our wages, we actually pay more than they do! And because there is a large group of poor in Singapore who cannot afford healthcare and education, there is a severe underconsumption and underspending in the utilisation of these essential public services in Singapore. By now, we have established that the purchasing power of Singaporeans is very poor, as compared to the Nordic countries and other high-income countries, but how bad is it? The high-income Singaporeans actually do have a higher purchasing power than the other high-income countries. So how much actually are low- and middle-income Singaporeans underconsuming, or actually overpaying? Find out more in the next part of our article – we will take you through the cash flows, and let you have a better understanding of how much “taxes” Singaporeans are actually paying. Written by Roy Ngerng 1 Comment Posted in How Much Tax Are Singaporeans Really Paying? 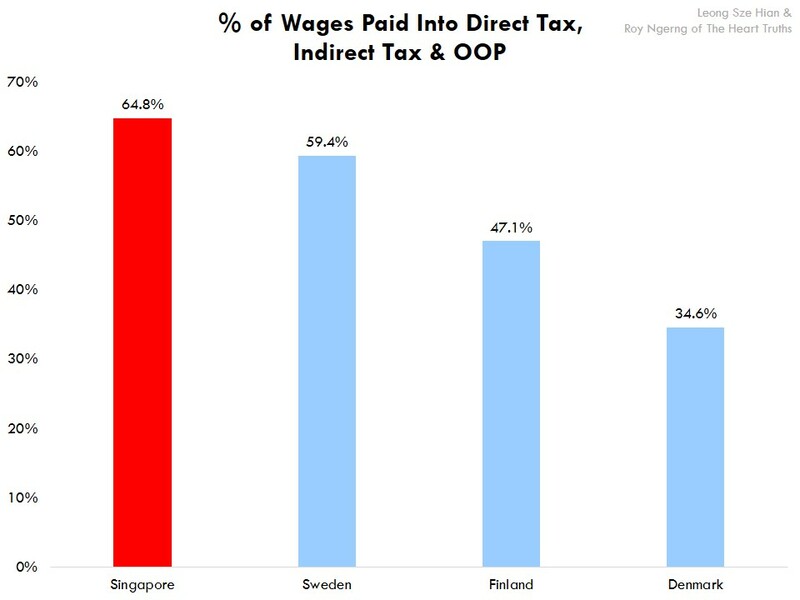 Singaporeans pay the highest proportion of our wages into taxes, as compared to the Nordic countries. This is because citizens in the Nordic countries earn much higher wages than Singaporeans do, and the citizens in the Nordic countries can thus have much higher purchasing power than Singaporeans. Over the past few weeks, we have shared with you how Singaporeans are paying almost as much as the citizens in the Nordic countries pay into taxes, social security/CPF and out-of-pocket expenditure for basic necessities. But that still isn’t the full picture. This is. What we have not taken into account is how much Singaporeans are actually being paid, and if we actually paying similar amounts into social expenditure as the citizens in the Nordic countries, what does that mean as a proportion of our wages? As we have shown in part 2 of the article, Singaporeans receive the lowest wages among the Nordic countries – the median wage in Singapore is the lowest. Also, Singaporeans seems to pay one of the lowest personal income tax and social contribution/CPF rate – we pay 20.8%, as compared to between 12.79% and 50% in the Nordic countries. But really, when it comes to how much we actually pay out, as compared to our wages, how much is that? As we had mentioned, on top of taxes and social security/CPF contribution, Singaporeans have to pay additional out-of-pocket for health, education and retirement. These are things that the citizens in the Nordic countries don’t have to. They need to only pay personal income tax and social security and receive next to free healthcare and free education and get back higher retirement funds than Singaporeans do. 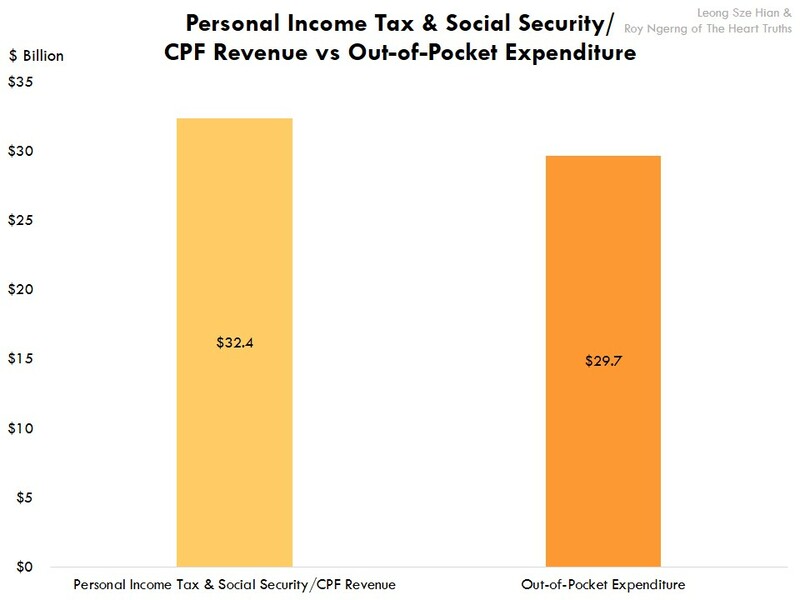 Thus when you compare what we pay into personal income tax, CPF and these out-of-pocket expenditure, and compare to what they pay only into personal income tax and social security, Singaporeans pay almost the same amount as they do. Singaporeans pay $16,260, as compared to the $17,305 to $22,336 that the citizens in the Nordic countries do. But what happens when you compare this to our wages? The median wage for Singaporeans is $3,000 monthly or $36,000 annually. For the citizens in the Nordic countries, it’s between $4,627 and $8,631 monthly or between $55,524 and $103,572 annually. When you look at what we pay into personal income tax, social security/CPF and out-of-pocket expenditure (for Singaporeans), this is when things get really interesting. For the Nordic countries, they only pay between 21.6% and 34.5% into personal income tax and social security. 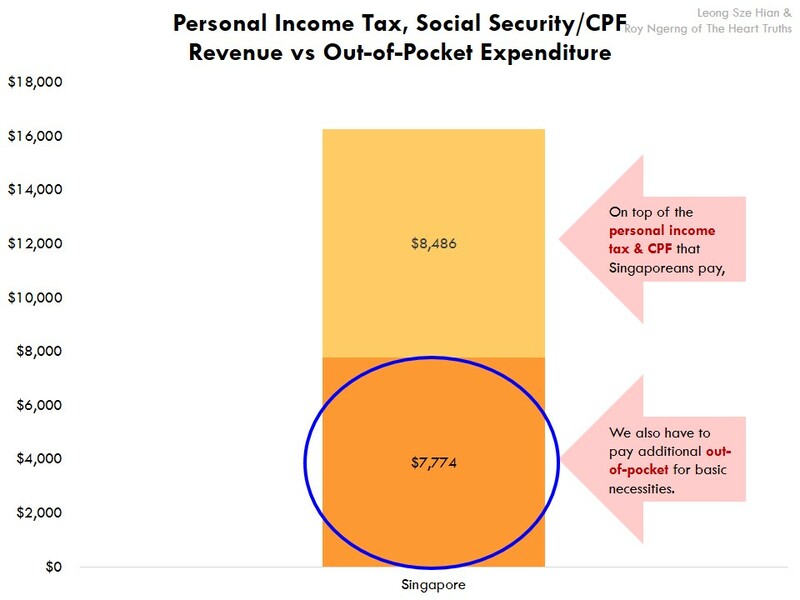 However, for Singaporeans, we actually have to pay a much higher proportion of 45.2% of our wages into personal income tax, CPF and out-of-pocket expenditure (Chart 1)! We are paying 16 percentage points more of our wages than what the citizens in the Nordic countries pay to get back the same as what they do! But what if we look at direct and indirect taxes, and out-of-pocket expenditure? As discussed, Singaporeans pay $22,334. This is compared to the $26,747 to $38,080 that the citizens in the Nordic countries do. And when you look at it as a proportion of wages, the citizens in the Nordic countries pay between 36.8% and 59.7% of their wages. 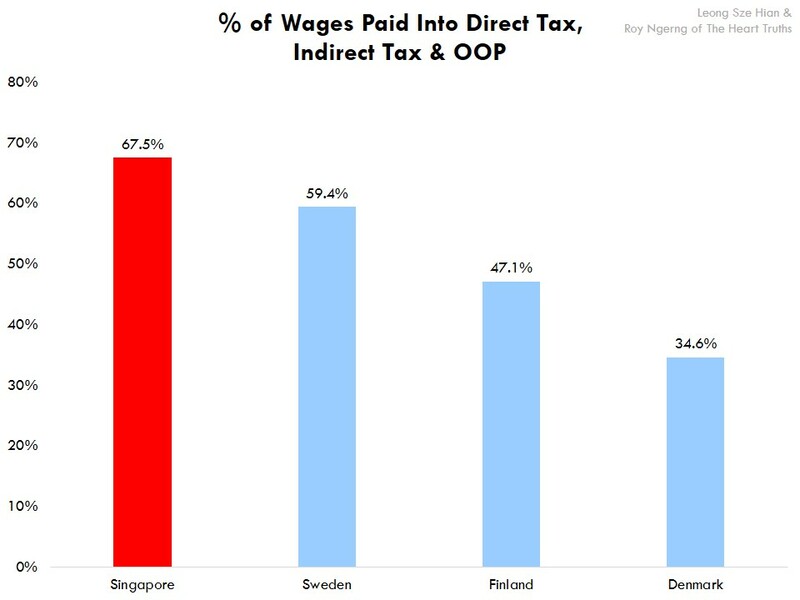 In comparison, Singaporeans pay 64.8% – higher than any of these countries – of our wages into direct tax, indirect tax and out-of-pocket expenditure (Chart 2)! We actually pay 18 percentage points more than citizens in the Nordic countries do! 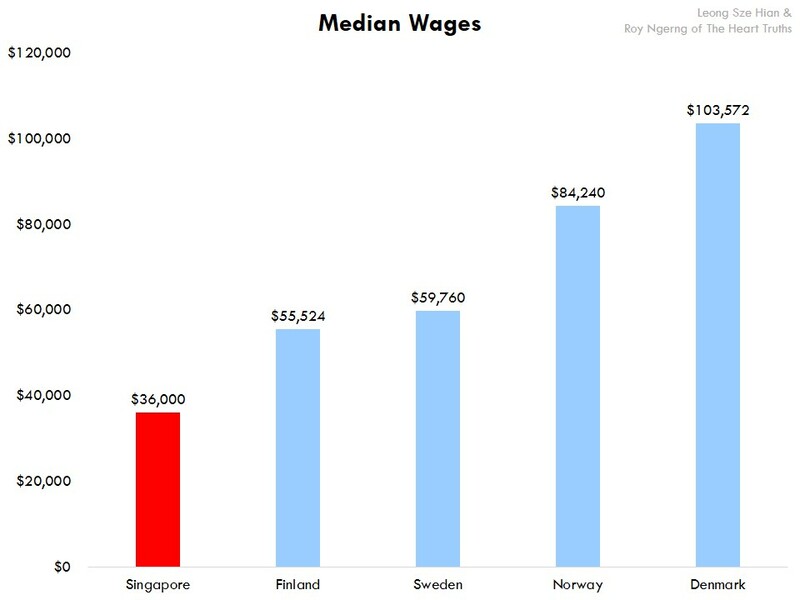 So, it really doesn’t matter that Singaporeans are paying slightly lower nominal amounts than the citizens in the Nordic countries do into taxes and social security, because when you look at it as compared to wages, we actually pay the most! We actually pay more than they do! 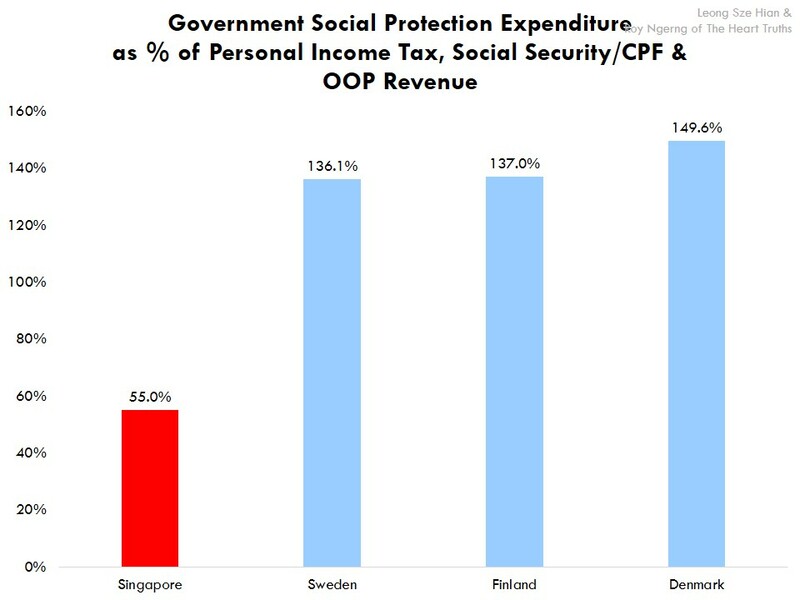 By now, you would have realised that even though Singaporeans have been told that we pay one of the lowest personal income taxes in the world, but when you really add it all up, what Singaporeans pay into taxes and social security, as well as for out-of-expenditure is actually the same as what the citizens in the Nordic countries pay only into taxes and social security, and get back as much, and even more than what the Singaporeans do. But, there’s still something else which we have left out. Do you know that the current expenditure isn’t at its most optimum? There is still some lost expenditure that has not been spent, because the poor cannot afford or assess the basic public services. And how much more is this? Check out our next article to find out more. Written by Roy Ngerng 15 Comments Posted in How Much Tax Are Singaporeans Really Paying? Singapore has a surplus of $36.1 billion. There is more than enough money for the government to spend for out-of-pocket expenditure that Singaporeans have to pay for healthcare, education and retirement, and ensure that even the poor are protected in Singapore. In the previous articles, we have showed you how Singaporeans are actually paying as much in tax as the citizens in the Nordic countries do, but yet their governments would spend more in return for them, whereas the Singapore government would spend much lesser. We have also been told by the Singapore government how it is difficult to increase subsidies for healthcare, education and retirement. Today, we will show you how this is not true, and how there is more than enough money to increase expenditure to cover all Singaporeans adequately. According to the official records, the Singapore government has accumulated $55.2 billion in revenue and $24.8 billion in CPF contributions – which would make up a total of $79.9 billion in revenue. In terms of expenditure, the government had spent $50.1 billion and there were $11.7 billion in withdrawal, which would make up $61.8 billion in expenditure. 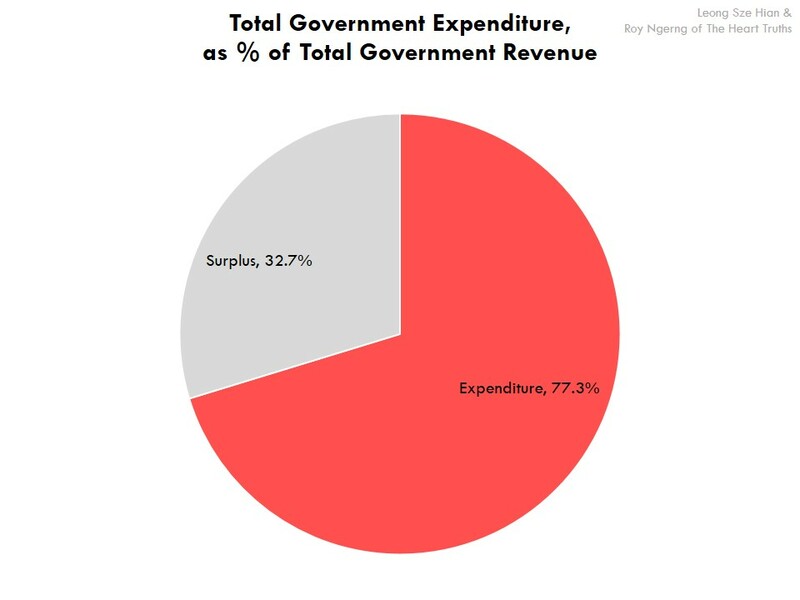 When you look at the expenditure as a proportion of revenue, from a cashflow perspective, the Singapore government is only spending 77.3% of the revenue collected (Chart 1). So, already, you can see that there is about 22.6% that is not spent that can be used to provide subsidies for healthcare and education and increase expenditure for retirement funds. We are primarily concerned about expenditure on social protection, so let’s take a look at the expenditure on social protection as a proportion of total expenditure. When we look at what Singapore is spending on social protection as a proportion of total expenditure, we would see that Singapore spends only 55.2% on social protection. In comparison, Sweden spends 68.3%, Finland spends 69.7% and Denmark spends 72.9% (Chart 2). So, is there more room for Singapore to increase our expenditure on social protection? But, this isn’t the end of the story, even though the Singapore government has declared a revenue of only $55.2 billion, according to the International Monetary Fund (IMF) Special Data Dissemination Standard, Singapore has actually earned a revenue of $82.3 billion! After the expenditure of $49.1 billion as reported by the IMF, Singapore would have a surplus of $36.1 billion. As calculated in part 4 of the article, Singaporeans have to spend an additional $29.8 billion on healthcare, education and retirement. And as discussed in part 1 of the article, because low-wage Singaporeans earn the lowest wages among the high-income countries, they simply do not have enough purchasing power to spend on healthcare and education, which means that they would be left out from being protected from their health and receiving higher education. On top of that, we have illustrated in the previous parts of these articles that if the out-of-pocket expenditure, coupled with the personal income tax and CPF, that Singaporeans are paying is similar to what the citizens in the Nordic countries only need to pay into personal income tax and social security, and receive healthcare, education and retirement for free, shouldn’t that mean that Singaporeans should receive the same treatment? Indeed, if Singaporeans have to pay $29.7 billion using our money, and the government already has a $36.1 billion surplus, wouldn’t it make sense if the government channels part of this surplus into subsidising for the healthcare and education of Singaporeans, and to increase the returns to our retirement funds? Even if the government were to fund the $29.7 billion fully, Singapore would still have $6.4 billion in surplus (Chart 3)! So, should the government spend more, especially when the poor in Singapore are being forced to keep themselves out from the system? Should the government spend more if it can, especially since at 26%, Singapore has the highest poverty rate among the high-income countries, and Singapore also has the highest income inequality among the high-income countries. 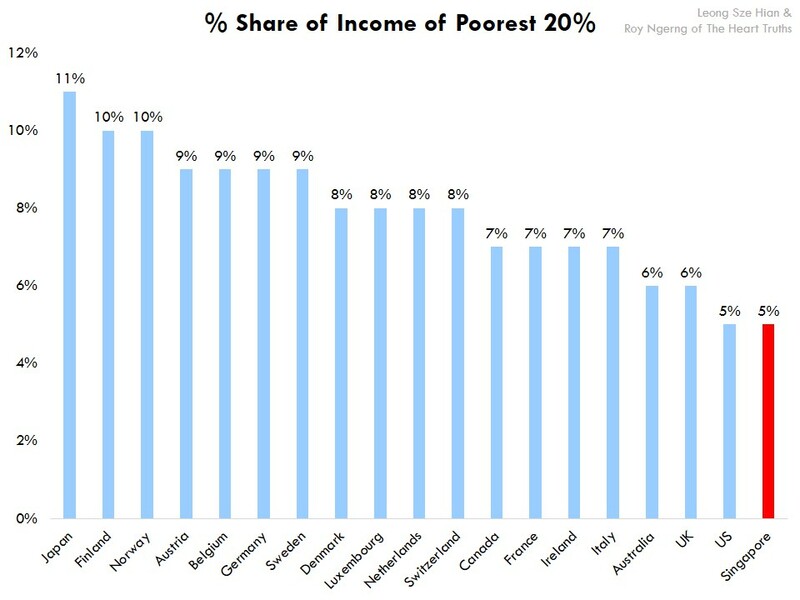 And as we have shared in part 2, the poor in Singapore has the lowest share of income among the high-income countries. In view of such inequalities and high prevalence of poverty, should the Singapore government start taking some form of responsibility and increase the government’s expenditure on social protection, to truly protect Singaporeans? So far, we have talked about how Singaporeans actually pay the same amount of “tax” as do the citizens in the Nordic countries. However, this is only half the story. 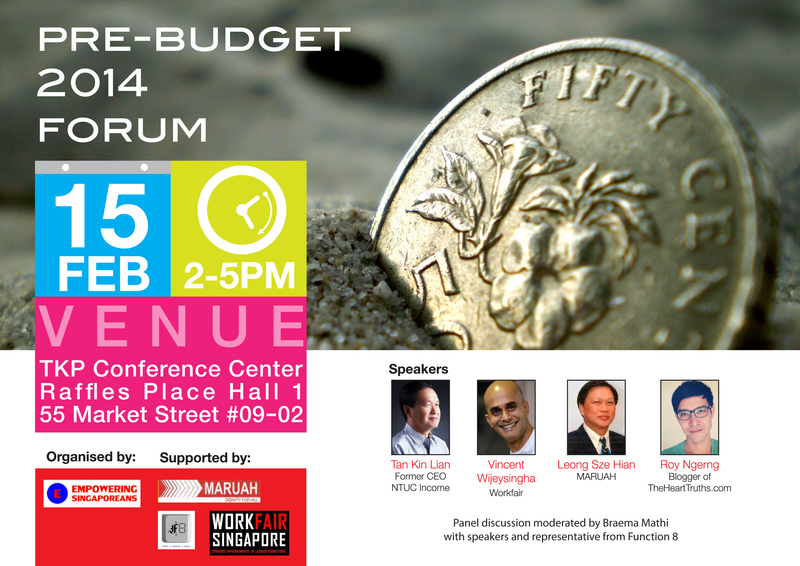 When compared to how much wages Singaporeans are actually paid, how much tax are we truly paying? Here’s a hint – Singaporeans aren’t paid high wages. Watch out for the next article for more shocking truths. Personal income tax in Singapore might be the lowest in Singapore, but Singaporeans pay 3.5 times more into indirect tax than direct tax. 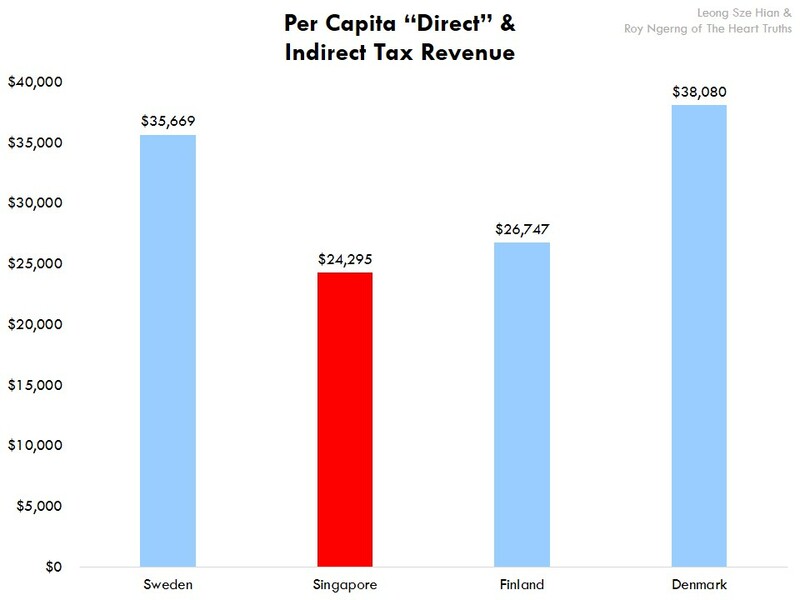 Singaporeans pay almost the same amount into direct and indirect tax, as the citizens in the Nordic countries do. 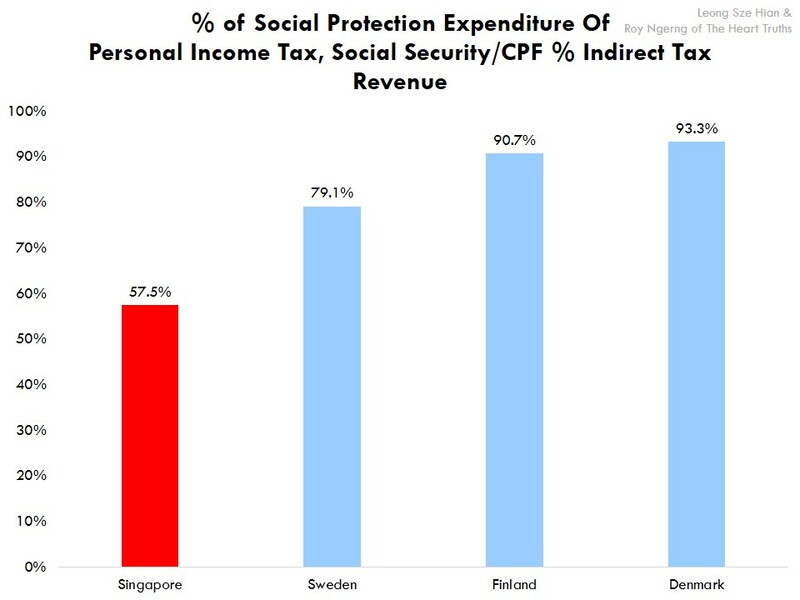 In the previous articles, we have shown you that what Singaporeans pay to personal income tax, CPF and out-of-pocket expenditure for healthcare, education and retirement, is actually the same as what the citizens in the Nordic countries pay into personal income tax and social security but receive healthcare, education and retirement for free. Also, we had shown you how for what Singaporeans pay, the government spends only about 60% of what we pay, whereas in the Nordic countries, their government would spend more than twice as much what the Singapore government would. In this article, we look at the issue of taxes from another angle – between direct taxes and indirect taxes. Carrying on from the last article, we would look at what Singaporeans pay into personal income tax, CPF and out-of-pocket expenditure as “direct taxes”, or $16,260. For the Finns, the direct tax is $17,305, $20,621 for the Swedes and $22,336 for the Danes. You can see that the “direct taxes” that we pay is similar to what the Nordic countries are paying. In Singapore, the total indirect tax that we pay on GST ($8.8 billion), stamp duty ($4.2 billion), betting taxes ($2.3 billion), property tax on private properties ($3.5 billion), excise duties ($2.1 billion), motor vehicle taxes ($1.8 billion), custom duties ($8.9 million), water conservation tax ($177.7 million), estate duty ($8.4 million) and other taxes ($4.1 billion) is a total of $27 billion. In the Nordic countries, the Finns pay $48.9 billion in indirect taxes, the Danes pay $80.1 billion and the Swedes pay $122.7 billion. As mentioned, Singaporeans have been told that we pay low income taxes, but when you compare income taxes with indirect taxes, you would see that Singaporeans pay 3.5 times as much into indirect taxes than direct taxes, whereas Swedes and Finns pay about the same indirect taxes as direct taxes, and the Danes pay only about a lesser 70% of direct taxes into indirect taxes (Chart 1). Thus is it really the case that Singaporeans pay low personal income taxes? When you include indirect taxes, Singaporeans actually pay a lot more of our income into taxes – 3.5 times more. When we add the indirect taxes into the “direct taxes” outlined above, the total taxes that Singaporeans are paying would be $89.1 billion. This would be $138.6 billion for the Finns, $193.7 billion for the Danes and $291.0 billion for the Swedes. When seen from a per capita basis, Singaporeans would be paying $23,334. The Finns would be paying $26,747, the Swedes, $35,669 and the Danes, $38,080 (Chart 2). 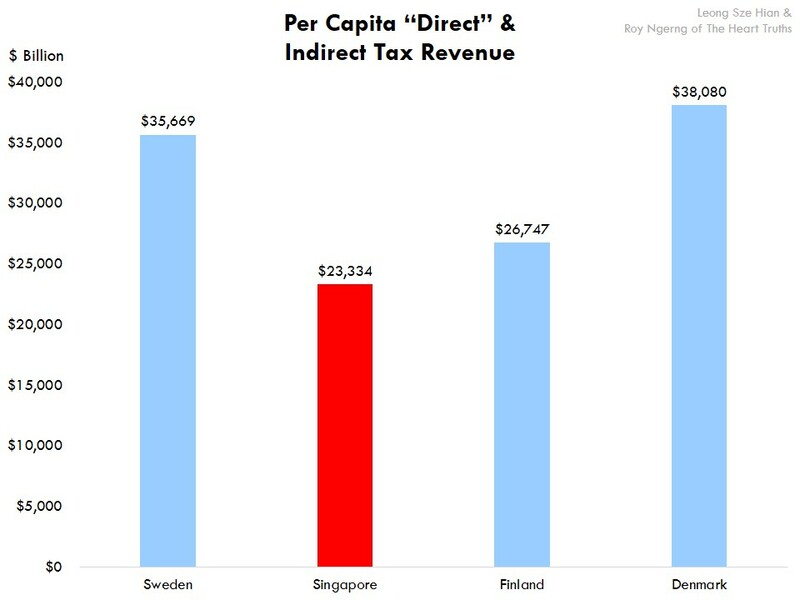 Thus you can see that when “direct” and indirect taxes are combined, Singaporeans are again, actually paying about the same amount as the Nordic countries. Perhaps the illustration below would be clearer. When we look at “direct” and indirect taxes as a proportion of the total government revenue, we see that this would form 91.1% of the Danish government’s revenue, 94.1% of the Finn’s revenue, and 96.7% of the Swedes’. 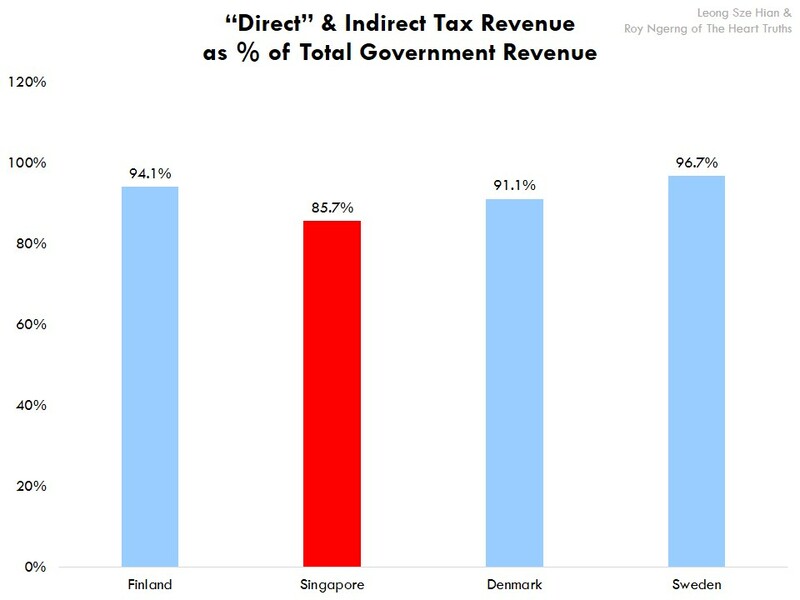 In comparison, our “direct” and indirect taxes would actually form 85.7% of the revenue – which is again, similar to the Nordic countries (Chart 3). By now, you would be able to see through the veil of what we have been told. We have been told that taxes are low in Singapore and thus Singaporeans should not expect the government to step in to subsidise for public services any further. However, in part 3 of the article, we have already shown you that when we look at personal income tax and CPF, Singaporeans are actually paying about as much as the citizens in the Nordic countries. In part 4, we went further to show you that on top of personal income tax and CPF, if we include out-of-pocket expenditure on healthcare, education and retirement, which the citizens in the Nordic countries don’t have to pay but get for free, we again pay the same amount as the citizens in the Nordic countries pay for personal income tax and CPF. Finally, in part 5, we showed that the Singapore government spends a much lower proportion of what Singaporean spends, whereas the governments in the Nordic countries would actually spend more than what their citizens spend. In effect, the government in the Nordic countries would subsidise the spending on public goods for their citizens, but in Singapore, Singaporeans have to subsidise the spending for government instead! Does this even make sense? And in this part, we also showed you that, when we include indirect taxes, Singaporeans are again paying about as much as the citizens in the Nordic countries. But as we have shown in part 1, 2 and 3, because of how wages are so unevenly distributed in Singapore, low-income Singaporeans would fall out of the system, because they cannot afford to pay for healthcare and education, and would never be able to retire. However, for the citizens in the Nordic countries, they would still be able to save on a regular basis, and not only that, they would be able to obtain free healthcare and education, and receive higher retirement funds than Singaporeans do – and it is not just a select group of people who are able to do so, but all of the citizens in the Nordic countries who are able to do so. Thus if Singaporeans are already paying as much as the citizens in the Nordic countries, but whereas the citizens in the Nordic countries can access the basic services for free, but where Singaporeans have to pay out-of-pocket, which results in the poor and a huge proportion of Singaporeans not being able to access these services, the question is – would Singapore be better off if we follow a tax structure that is similar to the Nordic countries? Not only is the tax structure in the Nordic countries more streamlined and straightforward, it is also more transparent. It is clear how much citizens give and how much they get in return. On the contrary, the tax and expenditure structure in Singapore is messy and Singaporeans have been made confused by how much we should get back in return. The result is that when we are told that the government does not have enough money to increase subsidies for healthcare and education, we blindly believe. But very clearly, the government can still increase its expenditure, and increase the subsidies for Singaporeans. Why do we say so? In the next part of the article, we will show you how. 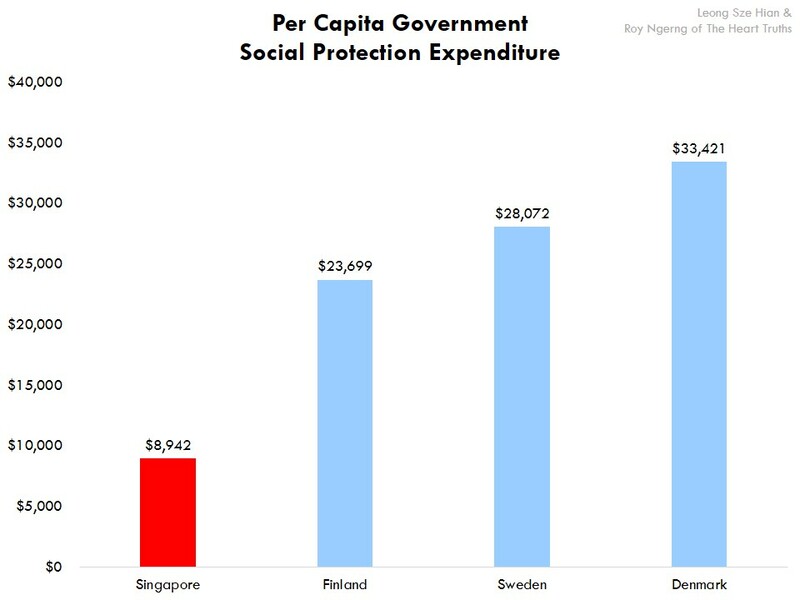 The Singapore government spends the least on social protection, as compared to the Nordic governments. 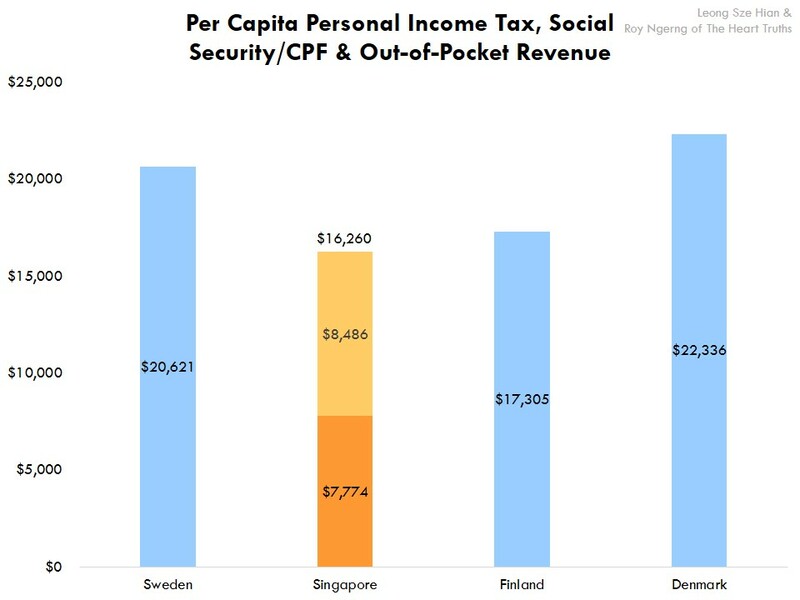 In the last part of the article, we showed you that what Singaporeans pay into personal income tax and CPF, and what we spend out-of-pocket for healthcare, education and retirement, is actually almost about the same as what the citizens in the Nordic countries pay into personal income tax and social security. Yet, they are able to receive healthcare, education and retirement for free, whereas we would have to pay out-of-pocket. The flipside is that the poor in Singapore is thus worse-off and if they cannot to pay, they cannot access services, such as healthcare and education. Yet, this shouldn’t be the case since Singaporeans pay as much as the citizens in the Nordic countries do. In this article, we will show you that for whatever Singaporeans pay into personal income tax, CPF and out-of-pocket expenditure, we may at most only get back what we pay. However, for the citizens in the Nordic countries, they get back significantly more than what they pay. According to the Ministry of Finance, the Singapore government spends $22.4 billion on social development, which includes healthcare. There was also a $11.7 billion withdrawal from CPF by Singaporeans. However, the above amount may be inflated, as we understand that it may include transfers to the Endowment funds, which are not social expenditure in the current year per se. At this point, it would be worth to note that of the $24.7 billion contribution by Singaporeans into CPF, there was only $11.7 billion withdrawn – Singaporeans do not even withdraw out half of what we put into CPF. Thus for some Singaporeans who might believe that the CPF is “our money” and that we should be able to take it out when we want to, the statistics doesn’t seem to show that. This would explain why the CPF have thus accumulated $230.2 billion of our monies thus far – 10 times what we have put in! 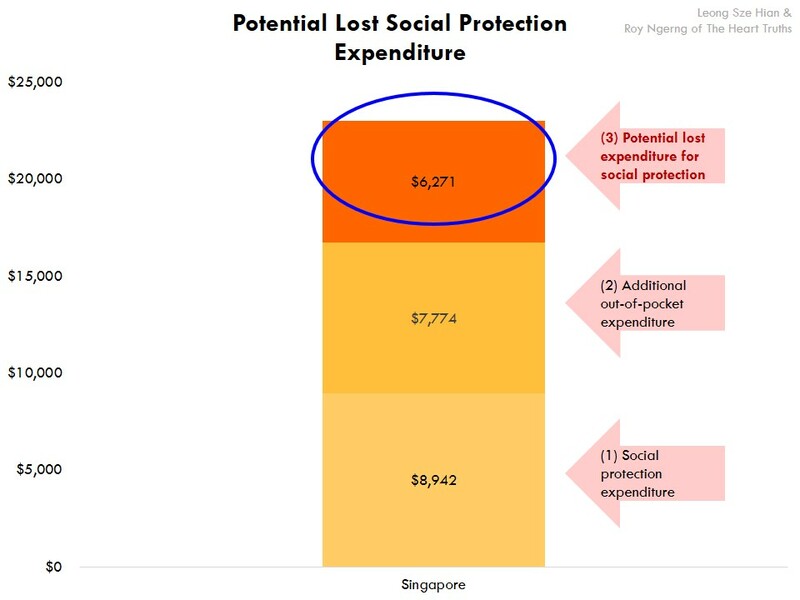 Thus in total, the Singapore government would in a sense, if we look at it from a cashflow perspective, spend $34.1 billion on social protection for Singaporeans (combining social development expenditure with CPF withdrawals). In comparison, in the Nordic countries, the Finnish government spends $122.8 billion, the Danes would spend $170.0 billion and the Swedes, $228.9 billion. This means that for each citizen, the Finnish government would spend $23,699, the Swedes, $28,072 and the Danes, $33,421. In comparison, the Singapore government spends a paltry $8,942, significantly much lower than the governments in the Nordic countries (Chart 1). In the previous article, we had showed you that the Finns would pay $23,699 into personal income tax and social security per citizen, the Swedes, $28,072 and the Danes, $33,421. Singaporeans pay $8,486. If you compare what the citizens in each country pay into personal income tax, and what they receive in terms of social protection, you would see that the citizens in the Nordic countries receive much greater returns on what they pay. The Swedes would have a return of 136.1% on what they pay in personal income tax and social security, the Finns would have a return of 137.0% and the Danes would receive 149.6%. However, for a Singaporean, they would only have a return of 105.4% (Chart 2). This means that the citizens in the Nordic countries are able to receive 36 percentage points more returns than we do, on what we pay to the government. But as we had illustrated in the previous article, Singaporeans also spend an additional $7,774 from our own money to pay for healthcare, education and retirement – this is something the citizens in the Nordic countries don’t have to do, as all of it is covered by the government for free. Thus if you add it all up, Singaporeans are really paying $16,260 in total for personal income tax, CPF and our own expenditure for healthcare, education and retirement. Seen in this light, the expenditure on social protection by the government would be only 55% of what we are paying. Now, if you compare with the Nordic countries, again, you would see that for what the citizens in the Nordic countries pay, they get back a return of between 136.1% and 149.6%. However, Singaporeans are only getting back 55% of what we pay – not even the full amount of what we pay (Chart 3)! In short, in the Nordic countries, the government pays more than the people to take care of its citizens. However, in Singapore, the citizens pay more than the government and the people may, arguably, be taking care of the government instead! In other words, the governments in the Nordic countries give back to their people only a third as much as what the Singapore government does. 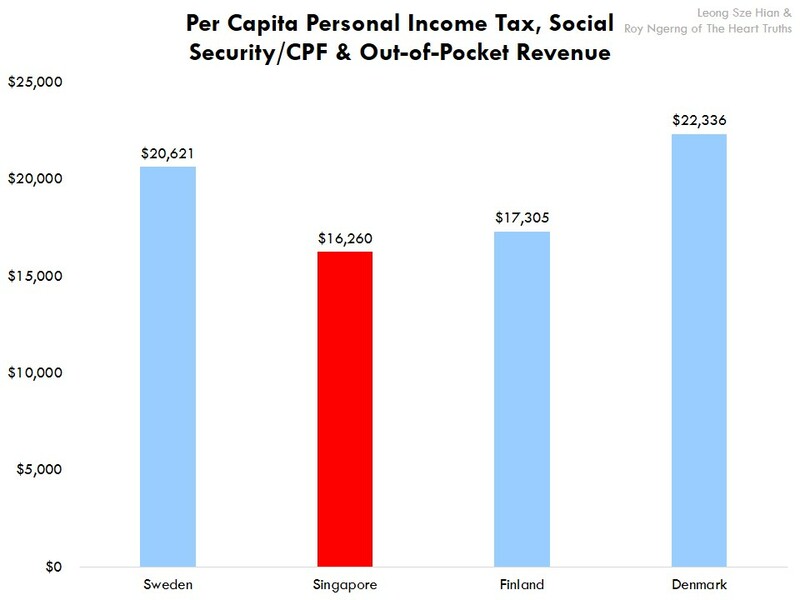 Now, mind you, as we have discussed in the previous article, Singaporeans pay the same into personal income tax, CPF and out-of-pocket expenditure as what the citizens in the Nordic countries pay. But yet, the Singapore government spends only half of what the governments in the Nordic countries are spending! The question then is – would you prefer a system where you could park your money with the government, where they would redistribute it back to you, and not only that, but top up a bit more and give you more than what you have put in? Or would you rather the Singapore system where the government gives back less, and on top of that, you still have to pay extra? And if you cannot afford to pay extra, you would be left out in the cold. At this point, it is quite clear that if Singaporeans are paying as much as the citizens in the Nordic countries, and the citizens in the Nordic countries are able to receive free healthcare and education, and higher retirement funds, while we have much lower subsidies for healthcare and education, and lower retirement funds, and still have to pay more out of our pockets, then wouldn’t it make more sense to follow the Nordic system, where we receive more returns from what we pay, and where everyone would be protected, and not like now, where the poor are left to fend for themselves? Still, we are not done yet. There is another twist to the story. Singaporeans might think that we pay low taxes, if we look at personal income tax – or direct tax. But what if we include indirect tax, or tax on goods, services and products that we purchase? Now, that’s another story which would again show you that Singaporeans are not paying the lowest tax. Look out for the next part of this article to find out more. What Singaporeans spend out from our own pockets for healthcare, education and retirement is almost the same as what we pay into personal income tax and CPF. 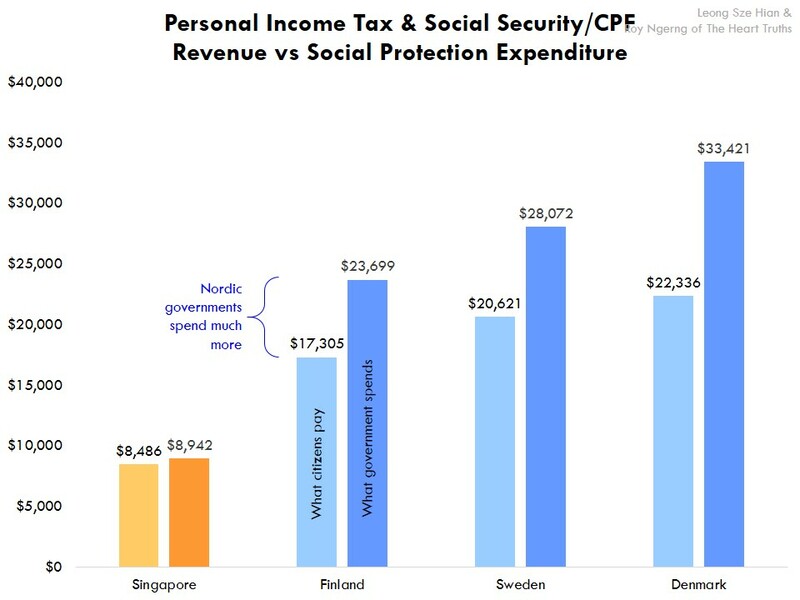 Singaporeans pay as much into personal income tax, social security/CPF and out-of-pocket expenditure as the citizens in the Nordic countries pay only into personal income tax and social security and get back healthcare, education and retirement for free. In short, we pay the same as the citizens in the Nordic countries do. In the last part of the article, we showed you how even though Singaporeans are paying about the same amount as the citizens in the Nordic countries into personal income tax and CPF, we still have to fork out more from our own pockets into healthcare, education and retirement, whereas the citizens in the Nordic countries are able to obtain these for free, from their governments. In this article, we will look into how much more Singaporeans have to pay, and how this actually compares with the Nordic countries. So, how much does Singaporeans have to pay by ourselves for healthcare, education and retirement? According to the Ministry of Health, Singaporeans pay $8,058 million out-of-pocket on total health expenditure. Of these, employers pay about 51% of the expenditure while Singaporeans pay about 49% – this means that Singaporeans pay about $4 billion for healthcare, using our own money. For education, we compiled the school fees paid to MOE and to universities, polytechnics and ITEs, and to tuition. MOE earned $118.5 million in school and institutions fees, whereas the universities, NUS ($328.7m), NTU ($256.2m), SMU ($77.5m), SUTD ($5.8m), SIT ($4.3m) and UniSIM ($88.7m) earned a total of $761.3 million. The polytechnics, SP ($56.9m), NP ($54.6m), NYP ($44.5m), TP ($40.5m) and RP ($40.2m) earned a total of $246.7 million, whereas the ITE earned $14.9 million. It is also estimated by Member of Parliament Denise Phua that the tuition industry “could be a S$1-billion-dollar industry”. We estimate that another $1 billion would be spent on other enrichment activities. Also, for childcare, the total number of childcare spaces is 92,779 and the full-day childcare median fees is $740 – which means that about $823.9 million is spend on childcare. Finally, there were 20,300 Singaporeans who had gone to universities overseas to study. Assuming that the tuition fees are about $100,000 a year, $2 billion would be spent in university education overseas. In total, Singaporeans would spend about $6 billion on education, by paying from their own pockets. For retirement, in a study conducted by the Singapore Management University and commissioned by the OCBC Bank, it was “found that Singaporeans aspire to spend $1,800 per month in their retirement years” in 2005. In 2013 dollar terms, this would be about $2,252. The minimum monthly payout from CPF Life for retirement that a member can start withdrawing at age 55 is $350, which may mean that Singaporeans may have a shortfall of as much $1,902 which would not be covered under the CPF. Of course, what we need to know is the breakdown of Singaporeans’ monthly withdrawal amounts in their retirement, in order to get a better picture of how many are short by how much relative to the benchmark of $2,252. The rough estimate of the total shortfall would be about $19.7 billion. In this connection, we estimate that only about 1 in 8 Singaporeans who reach 55 are able to meet the current CPF Minimum Sum of $148,000 entirely in cash from their CPF OA and SA accounts. In total, Singaporeans would have to spend, using their own money, about $29.8 billion, for healthcare, education and retirement. Now, if you would remember, citizens in the Nordic countries would just need to pay personal income taxes and social security contribution to receive next to free healthcare, free education and funds for retirement. In comparison, in order for Singaporeans to get the same outcomes, we need to not only pay personal income tax and CPF, but we also have to pay the private expenditure for the items outlined in this article above. Thus, if you add it all up, on top of the personal income tax revenue of $7.7 billion and CPF revenue of $24.8 billion that Singaporeans have to pay, we also have to pay an additional $29.7 billion to fund our healthcare, education and retirement. This is a massive 92% of what we pay into personal income tax and CPF (Chart 1) – almost twice of what we pay into personal income tax and CPF! In total, Singaporeans would pay $62.1 billion into personal income tax, CPF and out-of-pocket expenditure for healthcare, education and retirement. This is in comparison to the $89.7 billion paid by Finns into personal income tax and social security, $113.6 billion by the Danes and $168.2 billion by the Swedes. But this is where the shocker really comes. When you look at how much each Singaporeans are paying, you will see that each Singaporean is actually paying $16,260. This is compared to the $17,305 paid by Finns, $20,621 paid by the Swedes and $22,336 paid by the Danes (Chart 2). Now, can you see that whatever we pay is actually the almost the same as what the citizens in the Nordic countries pay? But mind you, all the citizens in the Nordic countries need to do is pay the same amount as what we pay into personal income tax and CPF, and they can access healthcare, education and retirement for free. But for Singaporeans, we have to pay not only into personal income tax and CPF, and because healthcare, education and retirement is not free, we have to pay additional out-of-pocket. But yet, at the end of the day, we are paying about the same amount! 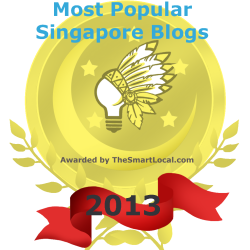 If you remember, in part 1 of the article, we had shown you how, for low-income Singaporeans, because they are paid low wages and have low purchasing power, they would have to forgo seeking medical treatment for their illnesses and their children might not be able to go to a university or polytechnic. However, for the poor in the Nordic countries, they would still be able to seek medical treatment, and still put their children, and themselves, through universities and polytechnics. However, for the high-income in Singapore, they would be able to pay for all these services out-of-pocket, yet have even more than their counterparts in the Nordic countries have to save. Why is it that Singaporeans are paying almost about the same amount as the citizens in the Nordic countries, but all their citizens have equal opportunities to seek medical treatment and education, and be able to retire, but for poor Singaporeans, they would be left out of the system and would be left to fend for themselves? If we are actually paying almost about the same amount as the Nordic countries anyway, shouldn’t we receive the same benefits? Shouldn’t the poor have equal chances to seek medical treatment, and their children should have an equal chance to attend higher education as well? So, the excuse as so often been given that because Singaporeans pay low taxes, the government cannot give higher subsidies for healthcare and education can no longer hold water. If we are already paying almost about the same amount as the people in the Nordic countries, and they are able to obtain free healthcare and education, shouldn’t Singaporeans also be able to obtain free healthcare and education, regardless of your income level? Now, given a choice, would you rather pay a higher proportion of your income into personal income tax and CPF, as the citizens in the Nordic countries do, and obtain free access to essential public services, especially since whatever we are paying, including for out-of-pocket spending for these services, is already almost about the same as what people in the Nordic countries are paying? But this still isn’t the end of the story. For whatever Singaporeans pay into personal income tax and CPF, and into these essential public services, whatever we pay may only be at most, whatever we may get back. But do you know that for the citizens in the Nordic countries, for whatever they pay into personal income tax and social security, they actually get more than what they pay back? Tune in to the next part of the article for the shocker. Written by Roy Ngerng 2 Comments Posted in How Much Tax Are Singaporeans Really Paying? 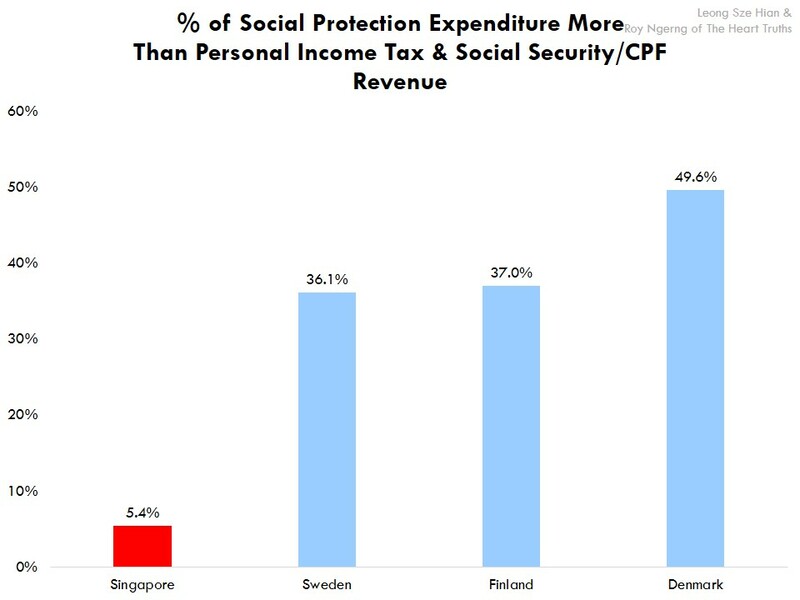 Singaporeans pay the lowest tax rate, but when including social security/CPF contributions, what Singaporeans pay isn’t too far off that what the citizens in the Nordic countries pay. In short, we pay almost the same as the citizens in the Nordic countries do. In Part 1 of the article, we had showed you how even though Singaporeans pay one of the lowest taxes in the world, for a low-income Singaporean, they are actually worse off than a citizen in the Nordic countries, even though people in the Nordic countries pay higher taxes. This is contrary to what the Singapore prime minister had claimed, that the poor in Singapore is “less badly off than if you were poor nearly anywhere else in the world”. In fact, the poor in Singapore are more likely to go into heavy debt, whereas compared to their counterparts in the Nordic countries, the poor in those countries are still able to save some part of their wages. In this article, we will dispel another myth. Do Singaporeans really pay the lowest taxes? According to the Inland Revenue Authority of Singapore, for the lowest-income earners in Singapore, the tax rate is 0%. For the highest-income earner, they would need to pay an overall tax of 20%. For the contribution rates to the Central Provident Fund (CPF), for a low-income earner who earns $800, he/she would need to pay a total contribution of 36%. However, do you know that because the “ordinary wage ceiling is $5,000”, this means that for a person who earns above $5,000, they would only need to contribute 20% of the maximum level of $5,000 into CPF. Thus for very high-income earners, they would pay virtually nothing more beyond the $5,000 to CPF. Thus, if you do the sums, a high-income earner may need to pay relatively less in percentage terms of his/her wages to tax and CPF, whereas a low-income earner may need to pay relatively more in percentage terms of his/her wages to tax and CPF. In effect, the low-income earner would have a relatively lower purchasing power than a high-income earner. As we had also written about in part 1 of the article, for low-income Singaporeans, because they are most likely to be in debt for the most part of their lives, this would mean that with the lower purchasing power, they are even worse off. But this isn’t yet the full story. Since the Nordic countries pay the highest taxes, we decided to look at how the taxes that Singaporeans pay compare with that of the Nordic countries. The personal income tax revenue collected in Singapore is $7.7 billion. In Finland, this is $49.4 billion, $109.4 billion in Denmark and $120.1 billion in Sweden (Chart 1). And what if we were to include CPF into the equation? The CPF revenue collected is $24.8 billion, which is more than 2 times what is collected in tax. In comparison, the social security revenue collected by the Danes is $4.2 billion, $40.3 billion by the Finns and $48.1 billion by the Swedes (Chart 2). 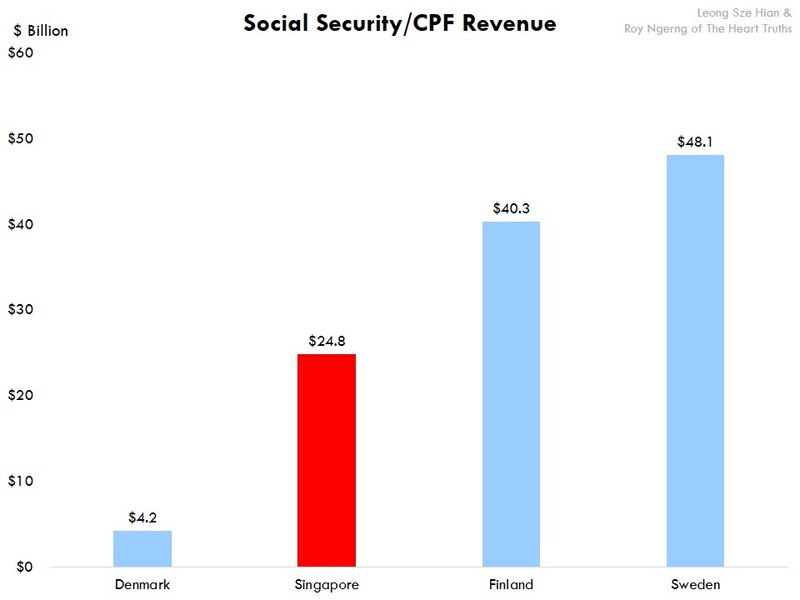 You can see that the CPF revenue that the Singapore collects is actually not that low, as compared to the Nordic countries. And if you look at the social security collected as a proportion of personal income tax, you can see that only in Singapore is the social security revenue higher than the tax revenue. 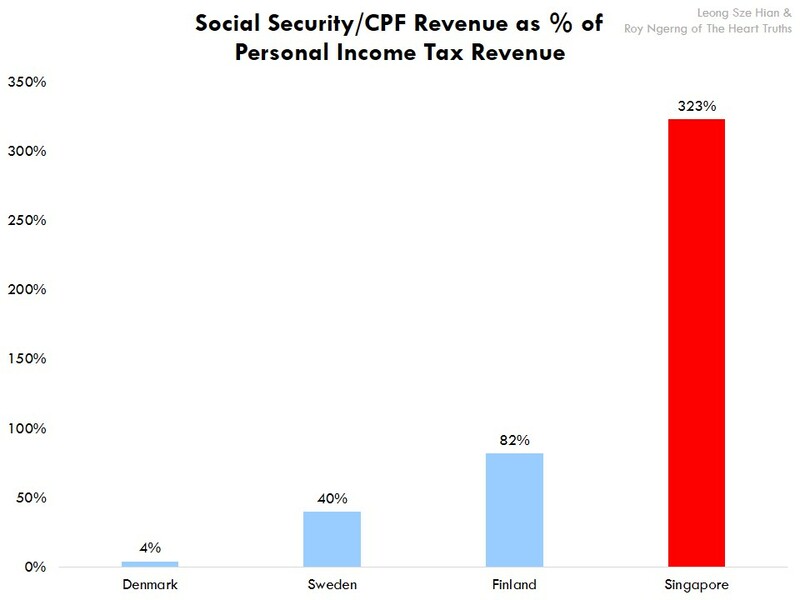 In Singapore, the CPF revenue collected is 323% the tax collected, whereas in the Nordic countries, the social security revenue is only between 4% and 82% of the tax revenue collected (Chart 3). So, even though it looks like Singapore’s personal income tax is low, when you put things into perspective, Singapore is collecting a lot more in CPF – more than what the Nordic countries are, and the overall tax and CPF is actually not that low. You would remember that for low-income Singaporeans, they pay 36% of their wages into CPF whereas for high-income Singaporeans, they would pay virtually nothing into CPF beyond the $5,000 monthly income cap for CPF contributions, but pay a lower 20% into tax. Since the CPF revenue collected is more than two times higher than personal income tax revenue, who do you think is footing the burden of the CPF revenue collected? Next, when you look at the tax and CPF collected as a proportion of the total government revenue, things become clearer. The total government revenue in Singapore, including CPF revenue collected is $79.9 billion. For Finland, it’s $143.9 billion, $200.2 billion in Denmark and $299.2 billion in Sweden. 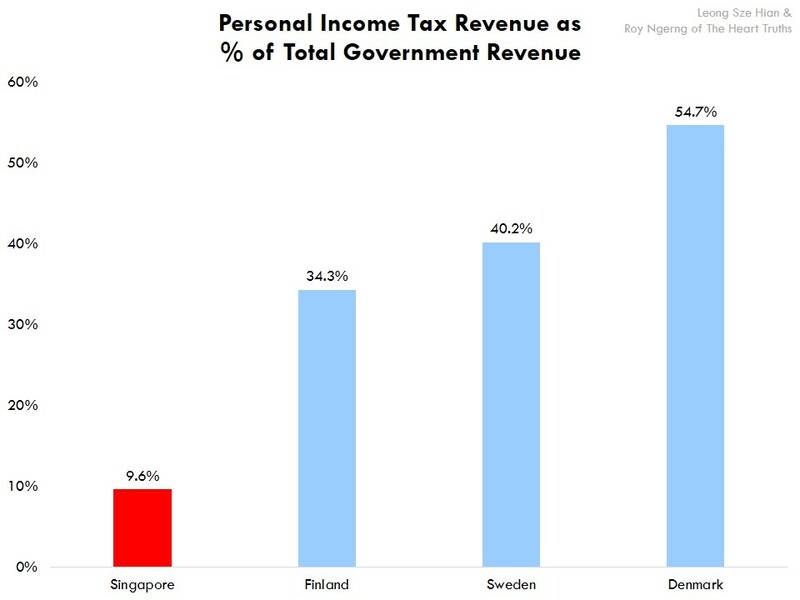 When you look at personal income tax as a proportion of total government revenue, indeed the personal income tax collected in Singapore is low – it forms only 9.6% of the total revenue collected, whereas it is 34.3% in Finland, 40.2% in Sweden and 54.7% in Denmark (Chart 4). But if you include CPF/social security, the picture looks very different. Singaporeans pay $32.4 billion into personal income tax and CPF, the Finns pay $89.7 billion, Danes $113.6 billion and Swedes $168.2 billion. Thus including CPF, personal income tax and CPF would form 40.5% of the total revenue – a significantly higher proportion. It would form 56.2% in Sweden, 56.8% in Denmark and 62.3% in Finland (Chart 5). You can see that when we compare the proportionate personal income tax collected, Singapore collects about 92% lesser than the Nordic countries. But when we compare the proportion personal income tax and CPF collected, this is only about 26% lower. This means that when we look at personal income and CPF as a whole, Singaporeans aren’t paying that much lesser than citizens in the Nordic countries. Thus if we are indeed paying somewhat similar amounts into tax and CPF as the Nordic countries, shouldn’t we be getting similar benefits as the citizens in the Nordic countries? The citizens in the Nordic countries are able to obtain next to free healthcare and education, and higher retirement funds, while Singaporeans have to pay 69% of the total health expenditure and pay the second highest university fees among the high-income countries. The question to ask is – why do Singaporeans still have to fork out so much of our own money to pay for our basic needs when the citizens in the Nordic countries are able to obtain these for free – what’s more when we pay about the same as they do into personal income tax and CPF? In summary, if we track the cashflows that Singaporeans pay, we are actually not much better off than citizens in the Nordic countries. But this is not all, as there are some more parts of this article that shall be published later. In the next part of the article, we will look into how much Singaporeans have to pay out of our own pockets, and how this would compare to the Nordic countries. When we include how much we pay out of our pockets with the Nordic countries, are we paying that much differently, or not? Written by Roy Ngerng 6 Comments Posted in How Much Tax Are Singaporeans Really Paying?